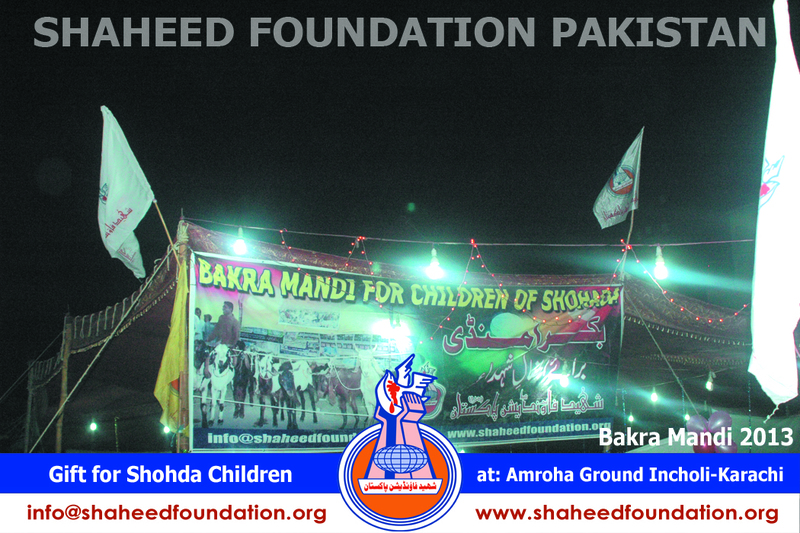 Shaheed Foundation not only caters to the financial needs of the shaheed`s family as many perceive, but takes cognizance of the overall ideological and spiritual development of the martyr`s family as well as the educational uplift and professional guidance for the heirs of martyrs. 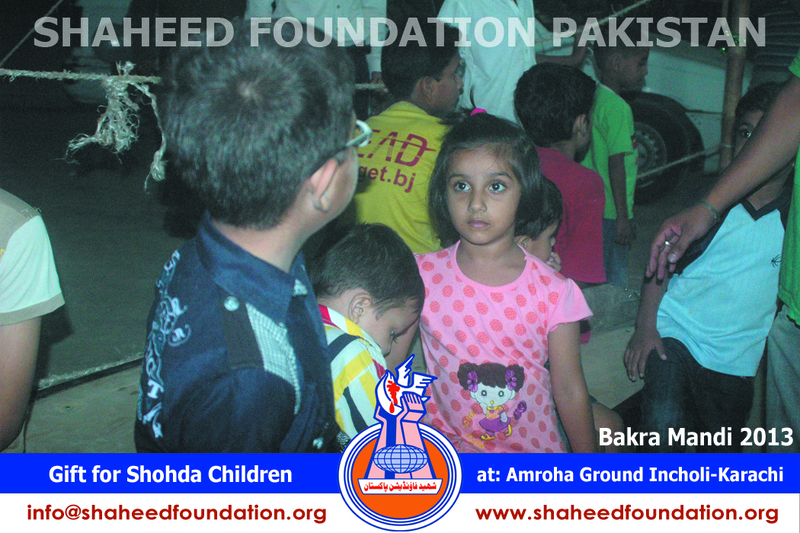 Shaheed Foundation Pakistan has from the very day of its inception kept in mind the bigger picture and always stressed on projects and activities that can systematically and periodically throughout the whole year at regular intervals, can help the organization engage the children, youth, ladies and elders of martyrs` families in positive entertainment in accordance with the principles of Islam. 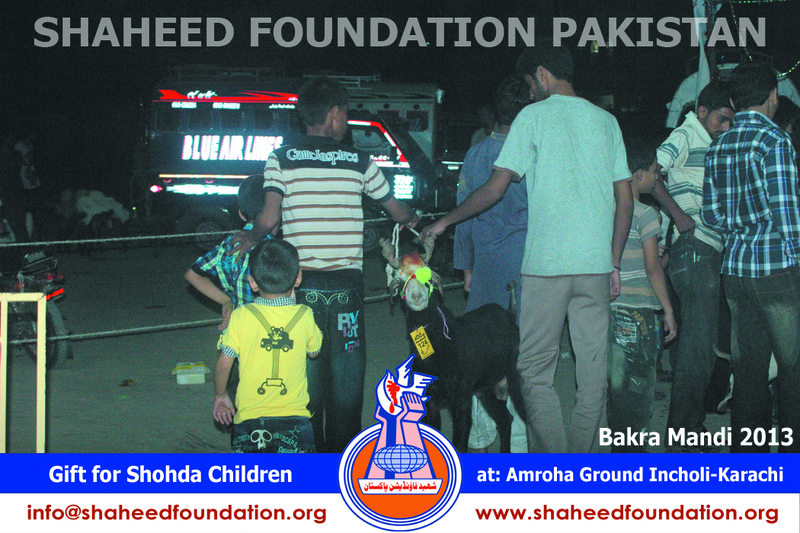 Over one a half decade has passed like the blink of an eye since foundation was established , but this approach has helped shaheed foundation develop really strengthened bonds of affection and respect with the families ,so much so ,that the martyrs` families trust the volunteers like their own family member ,which is indeed an immense feeling of exaltation for the volunteers ,something that can only be felt and cannot be described in words . 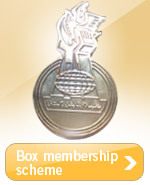 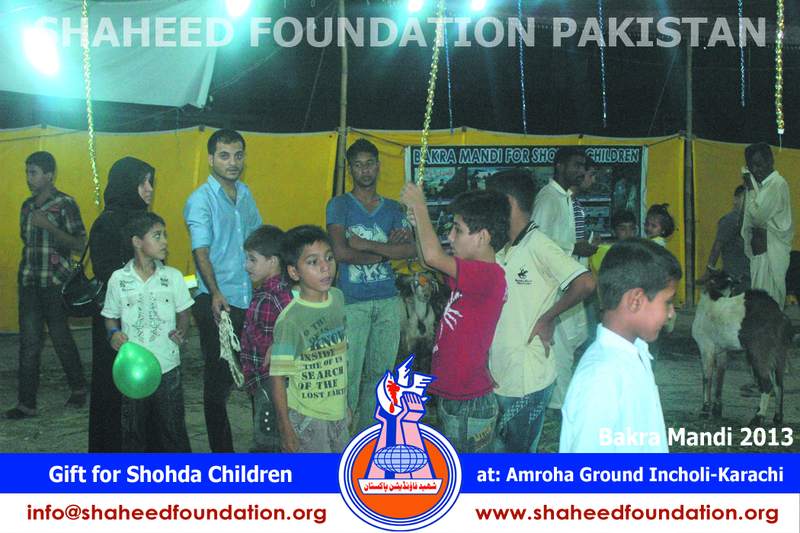 A glimpse can be observed especially on occasion of different activities and events. 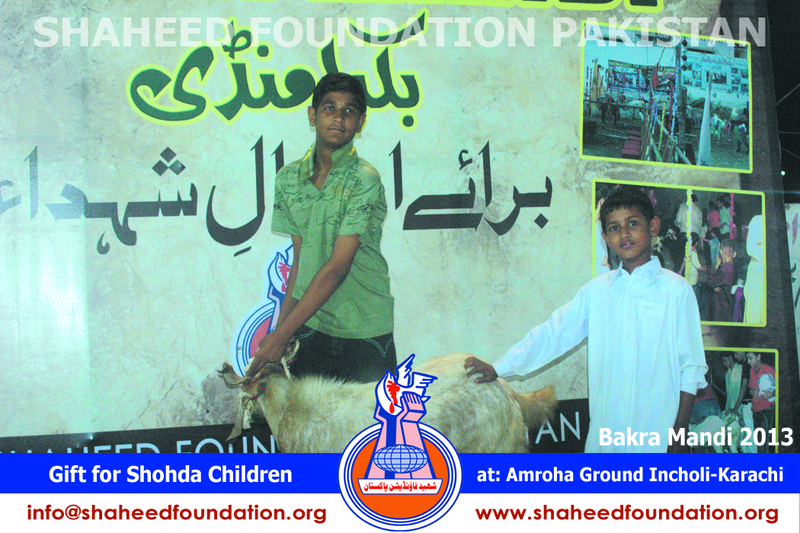 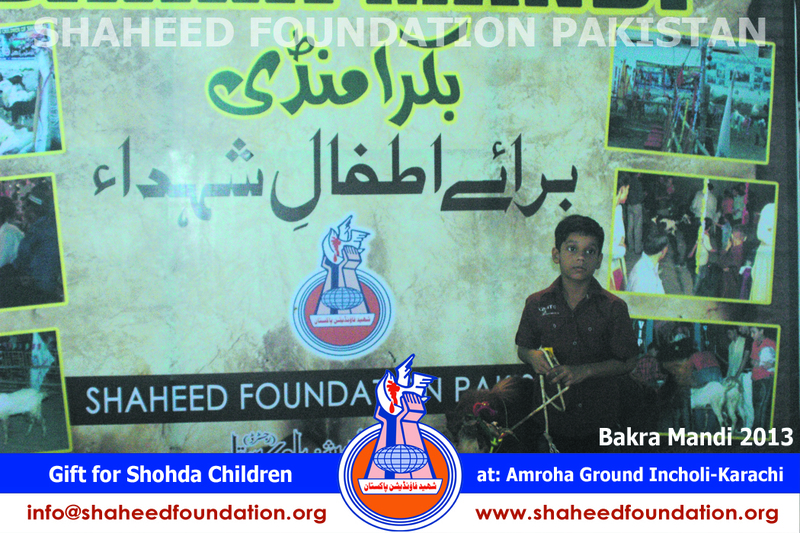 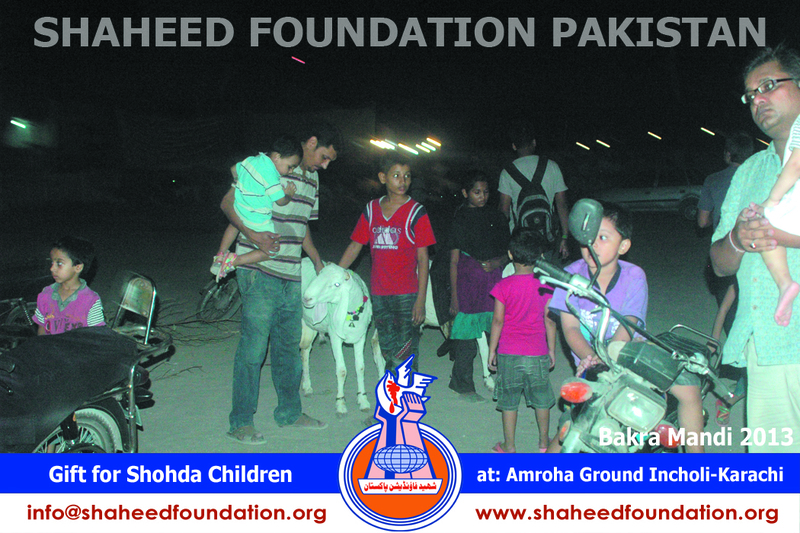 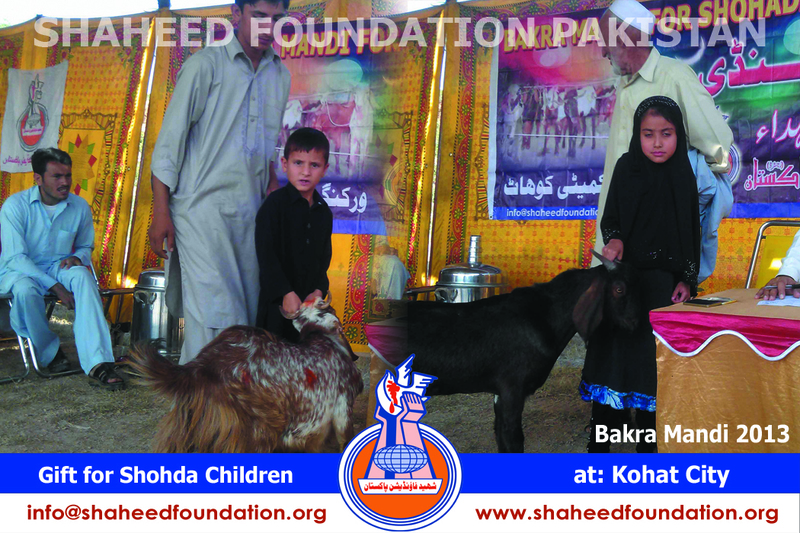 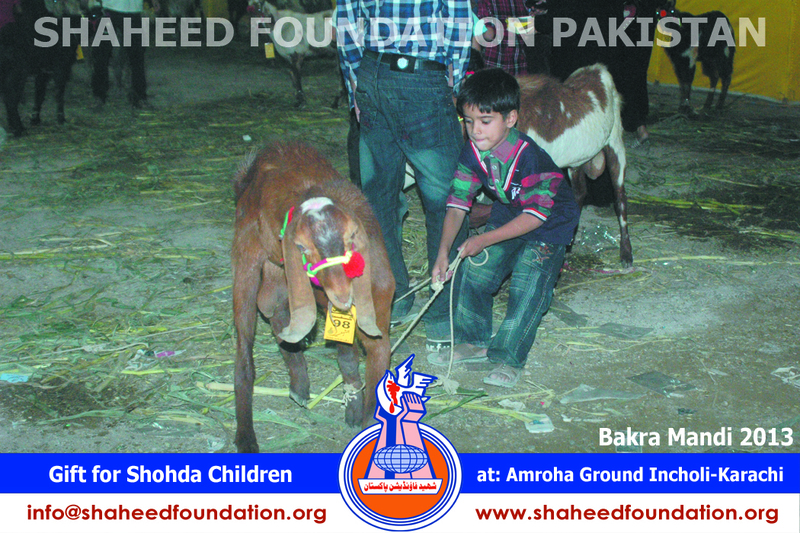 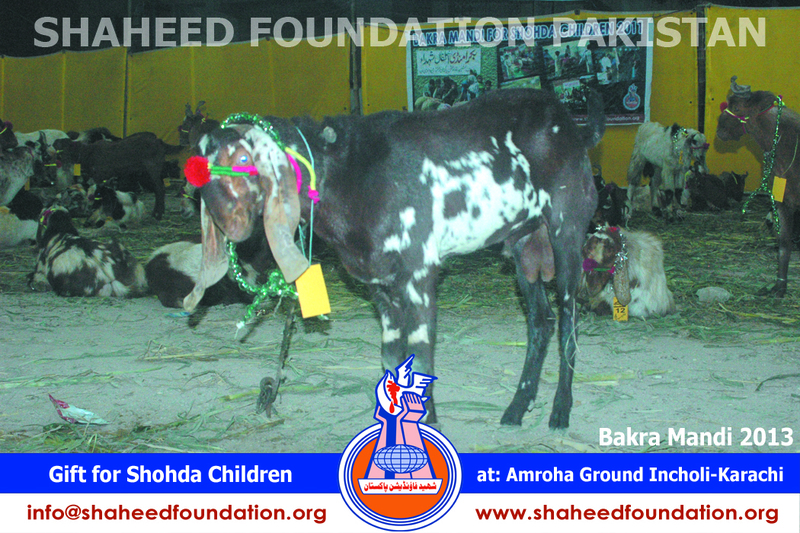 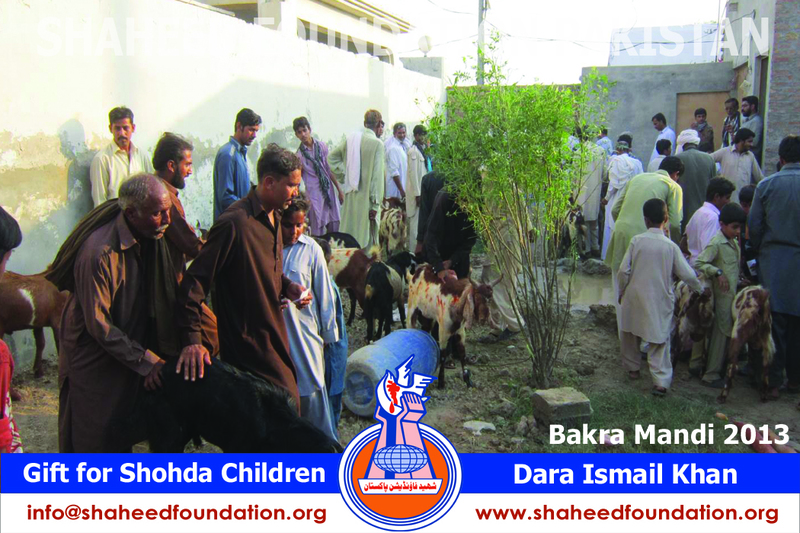 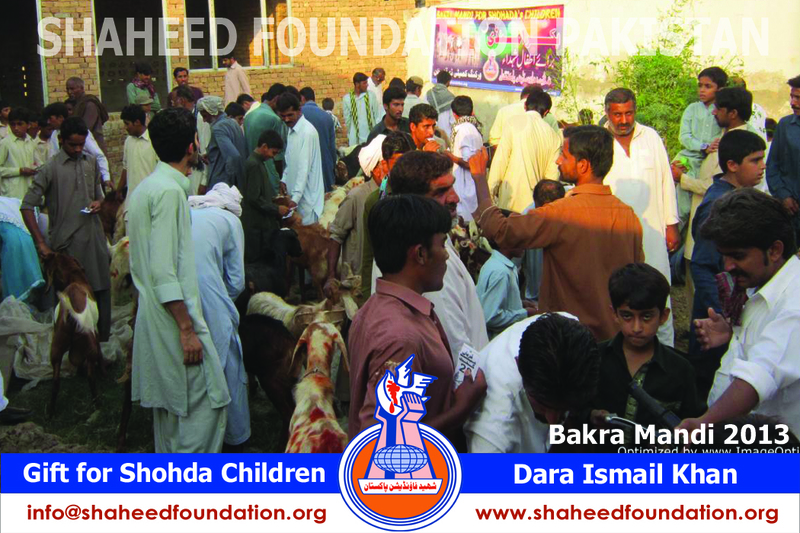 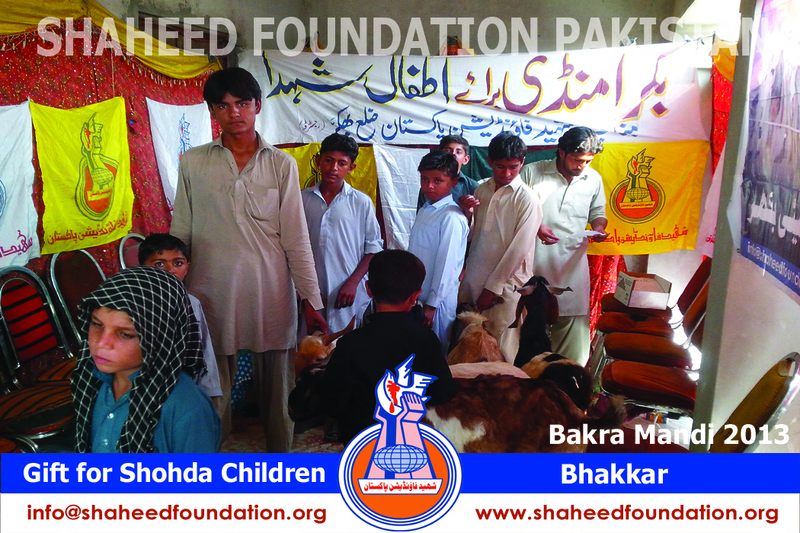 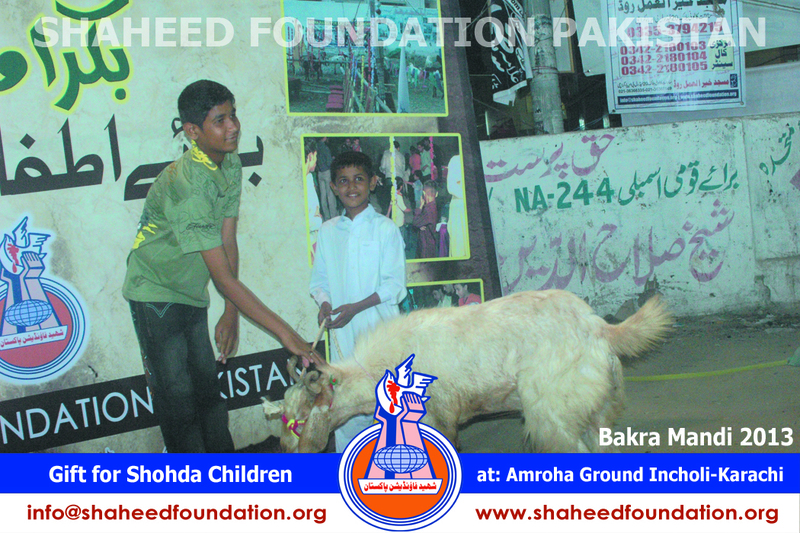 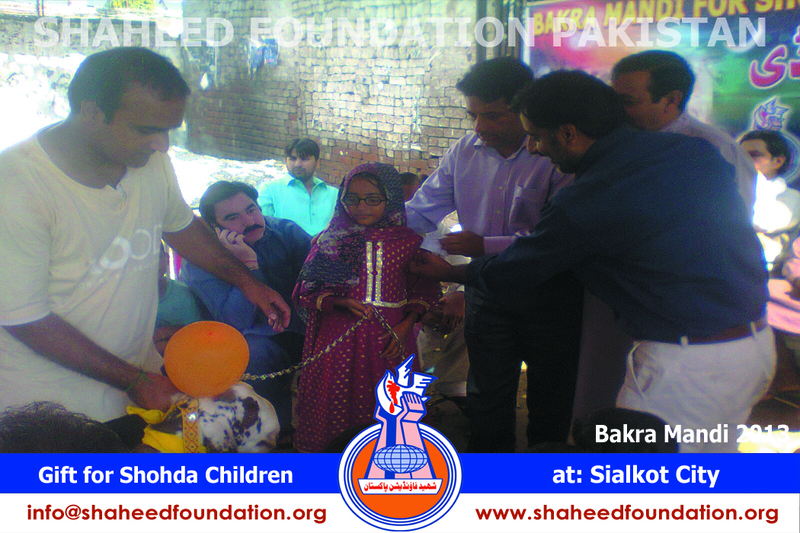 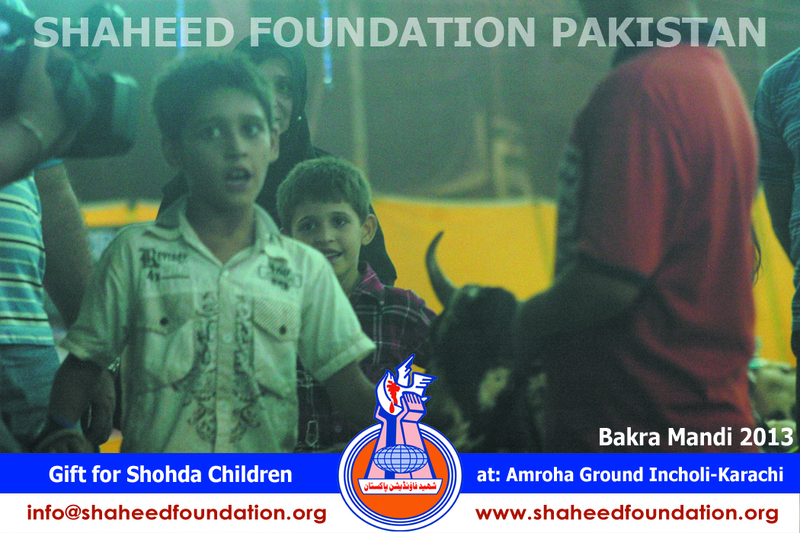 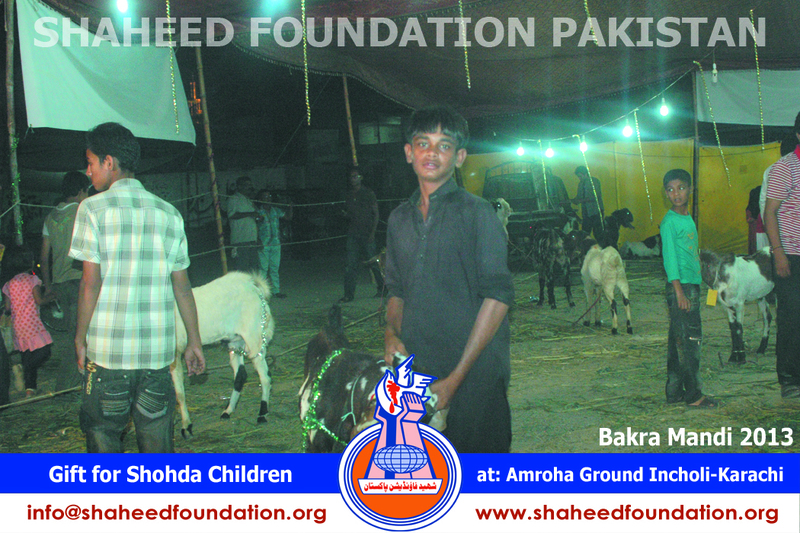 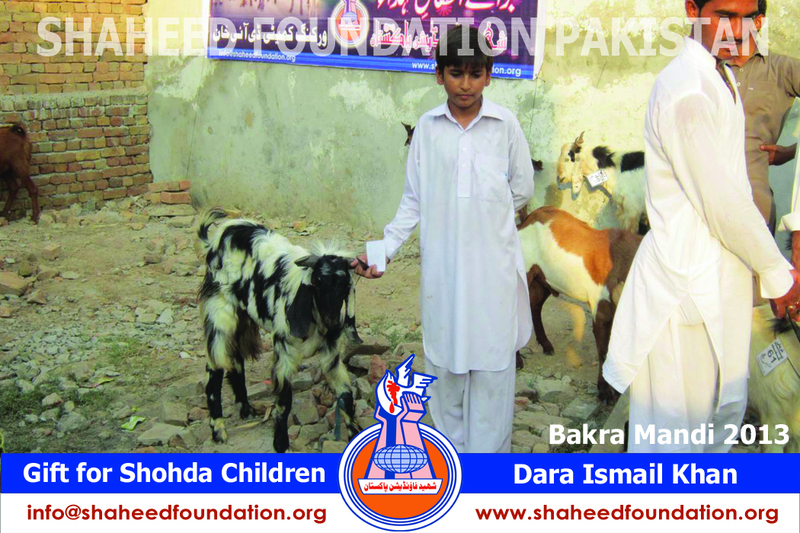 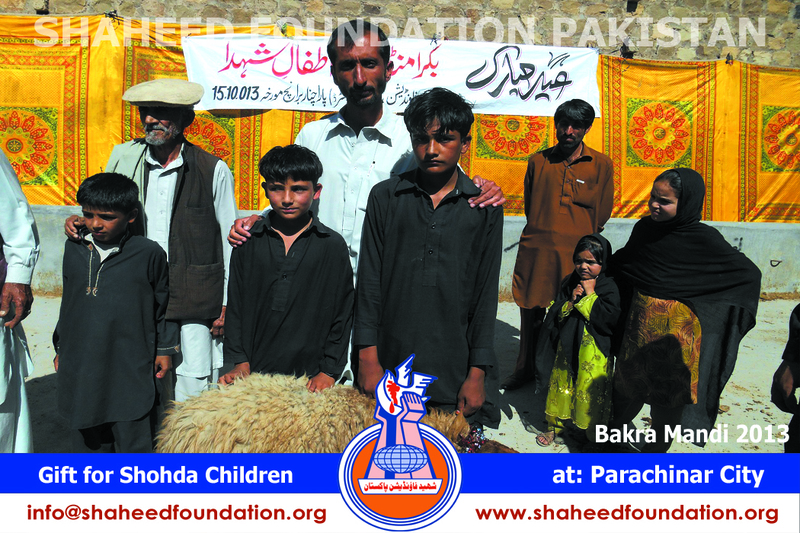 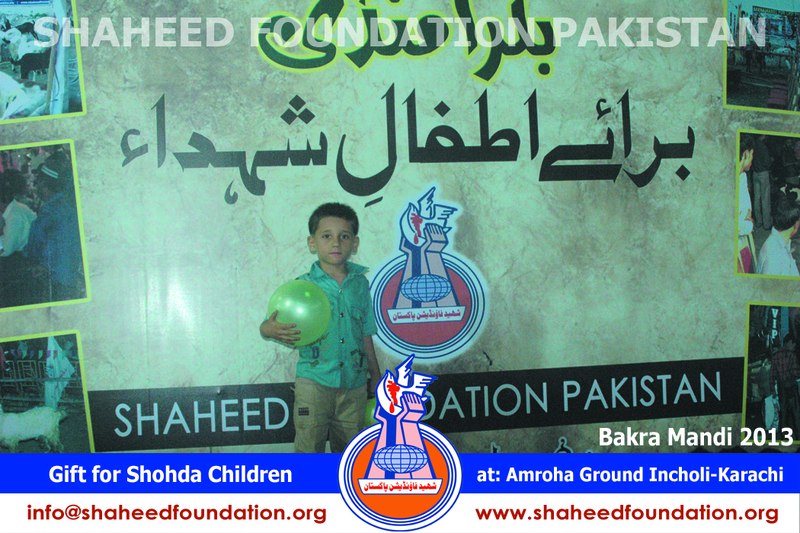 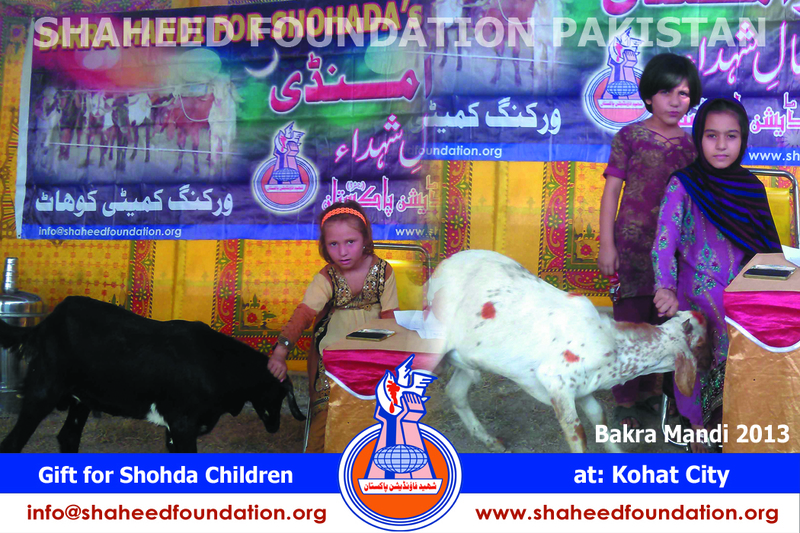 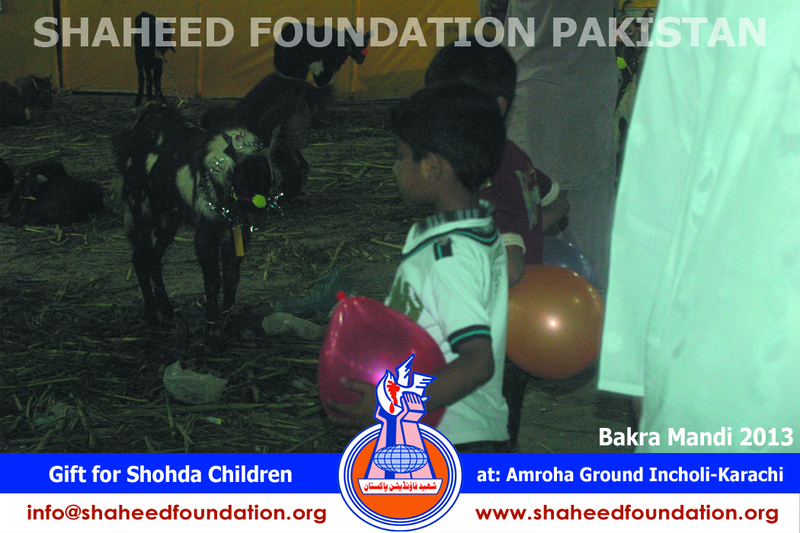 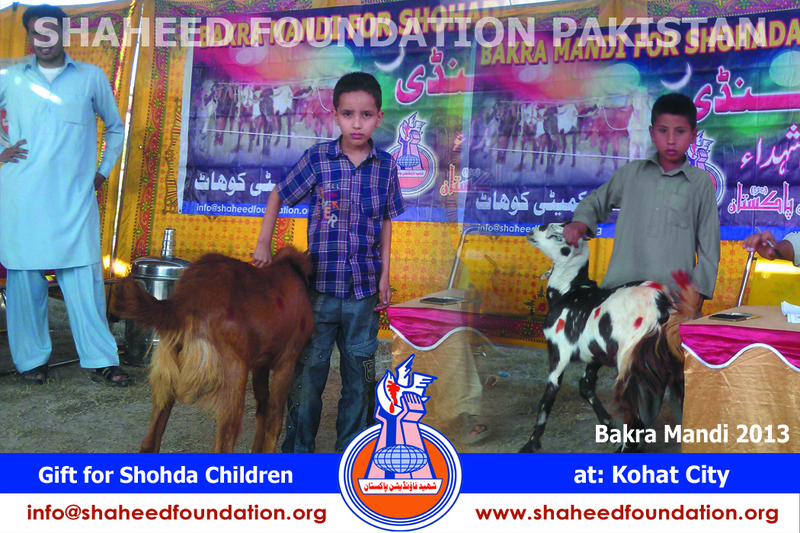 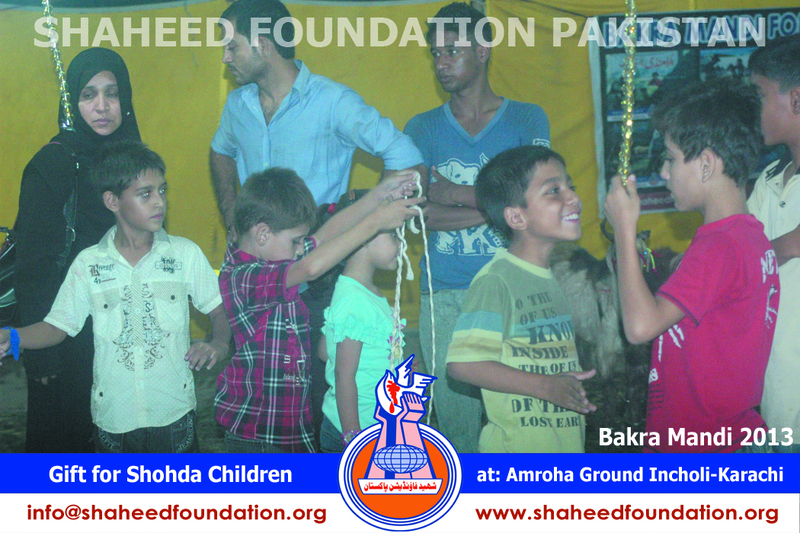 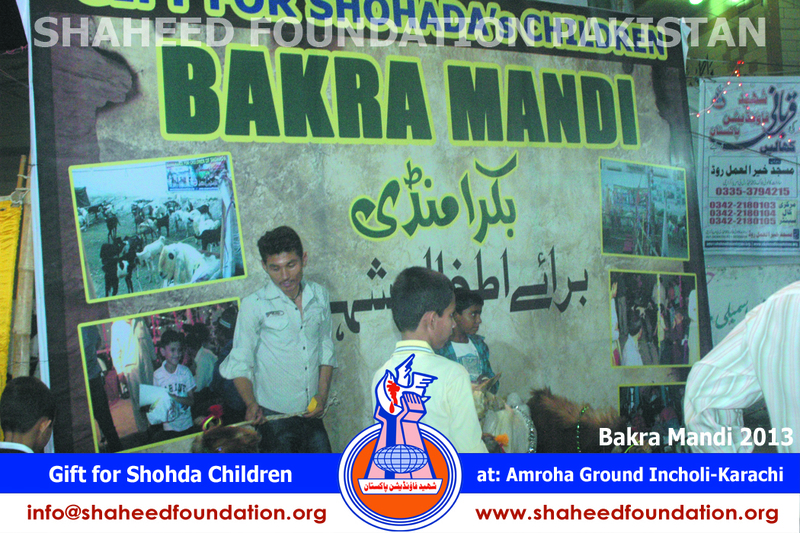 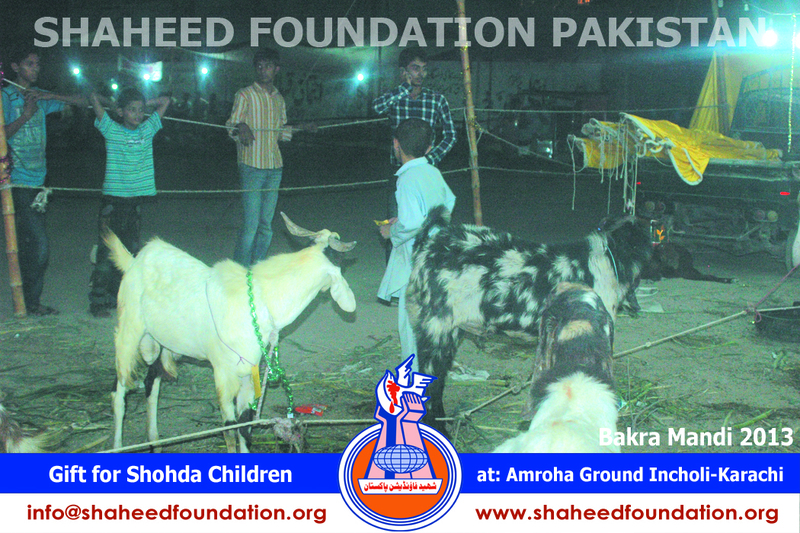 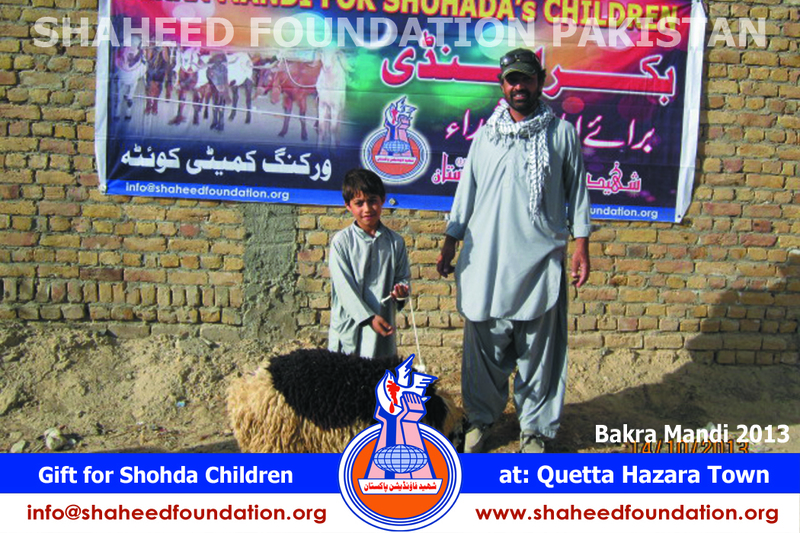 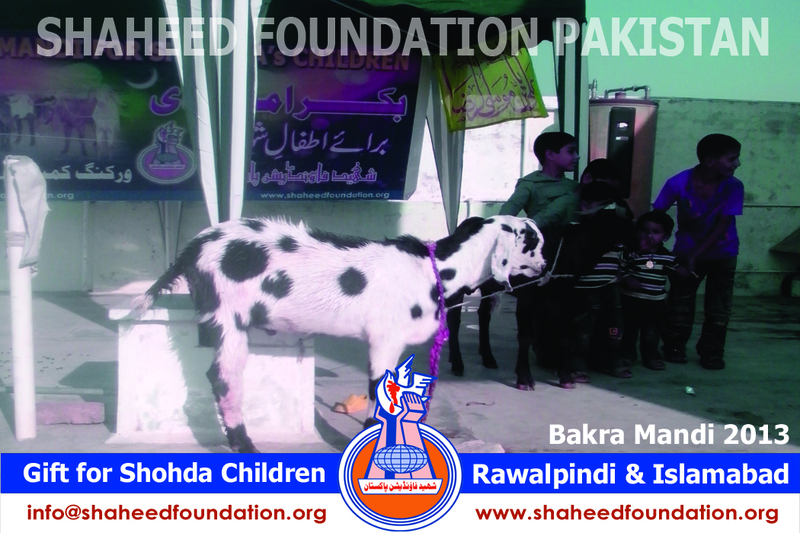 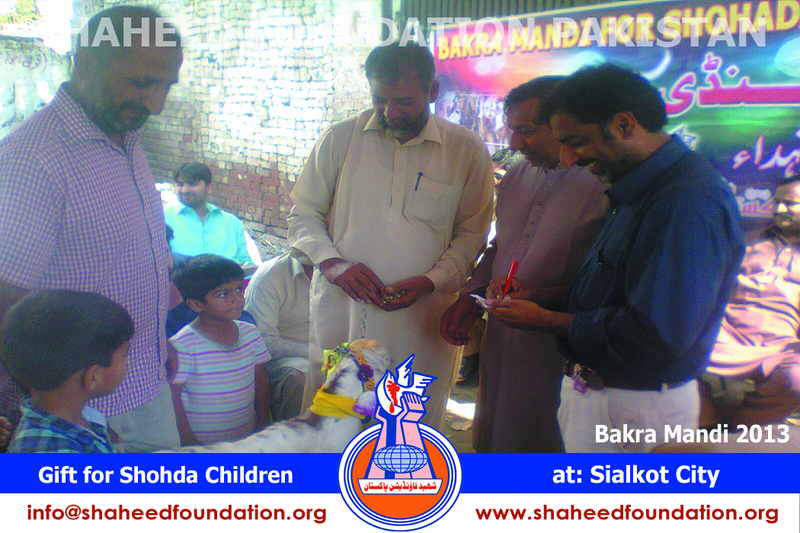 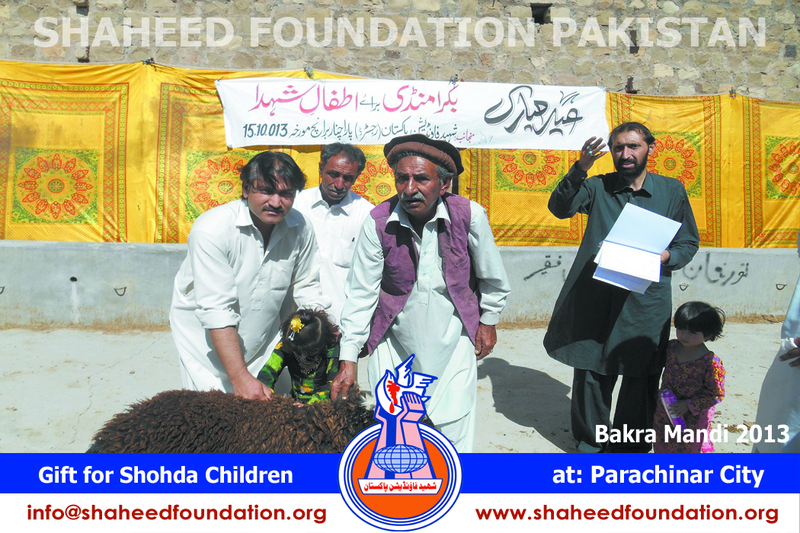 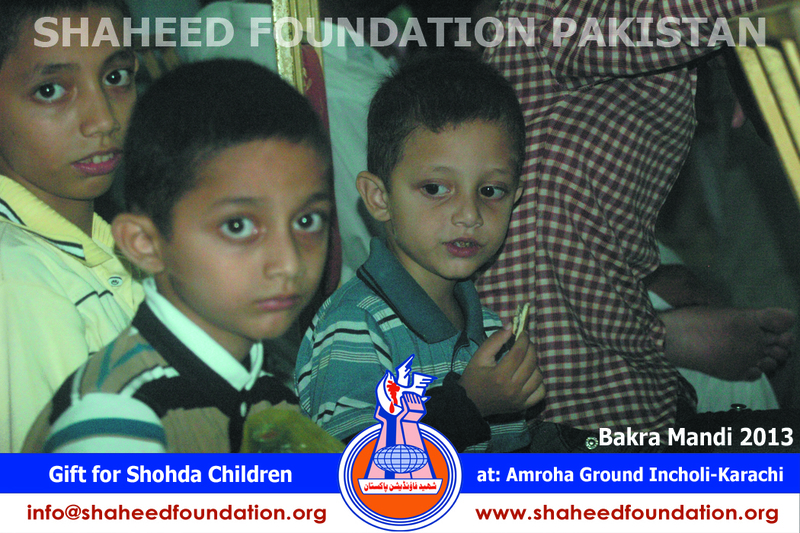 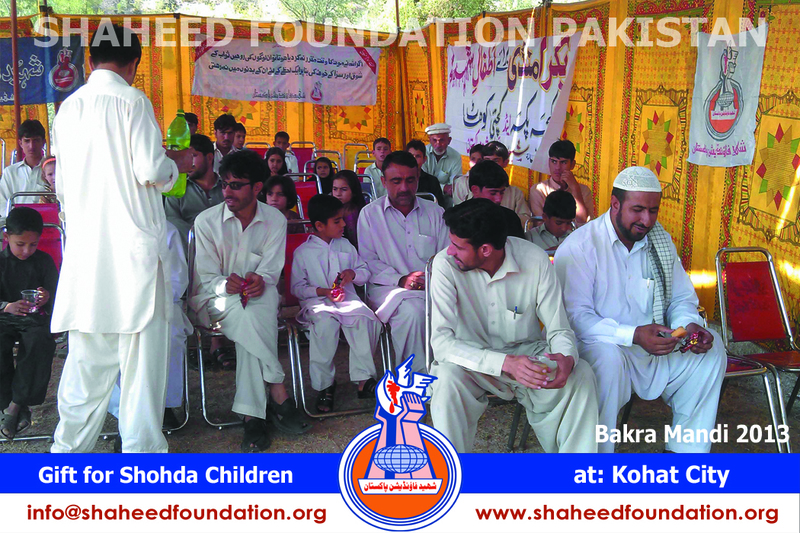 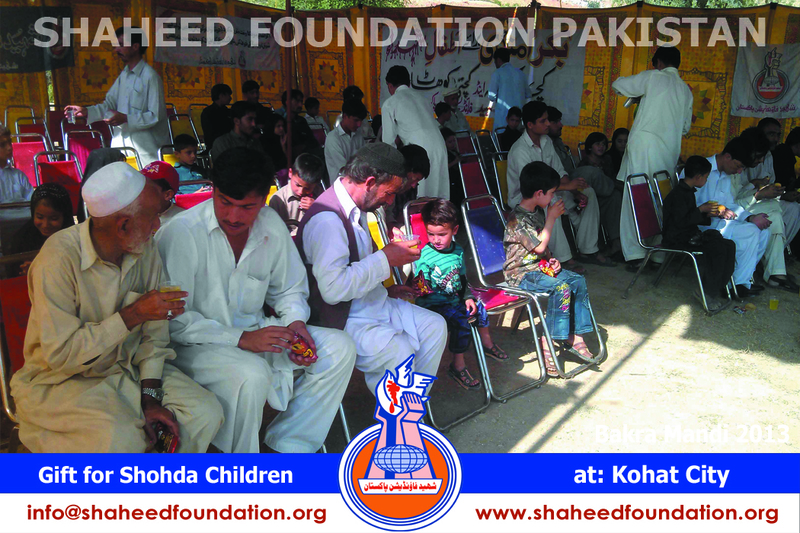 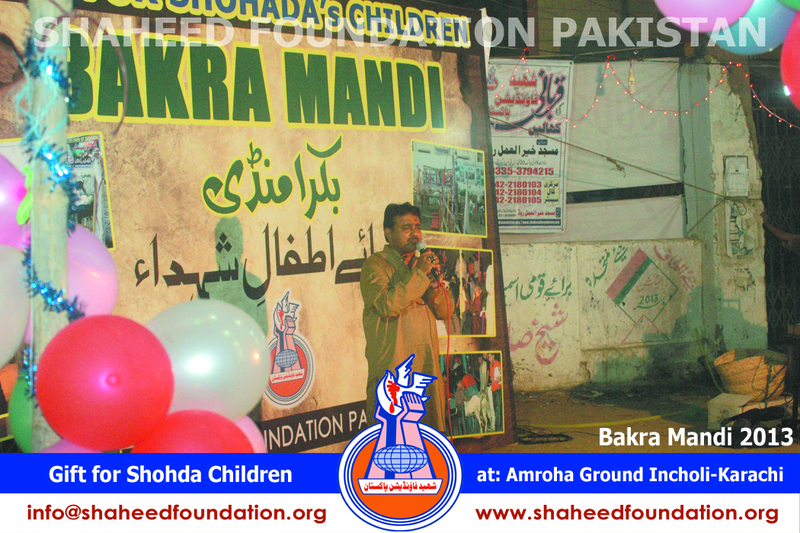 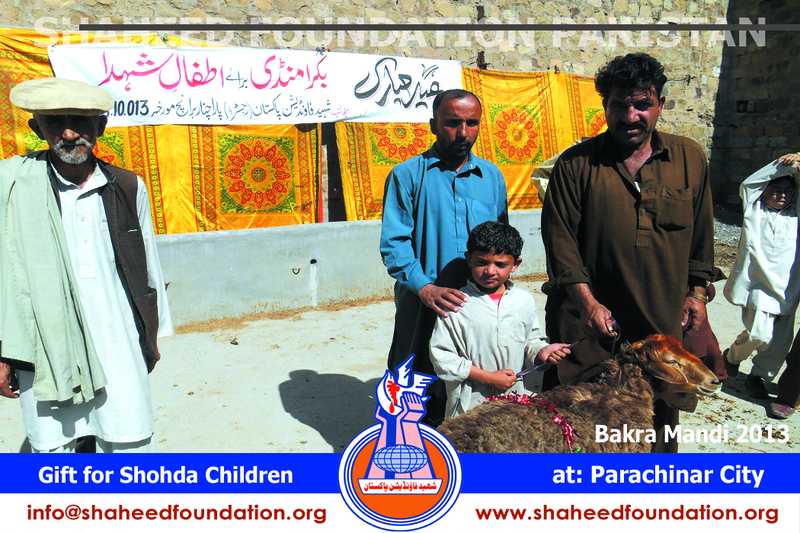 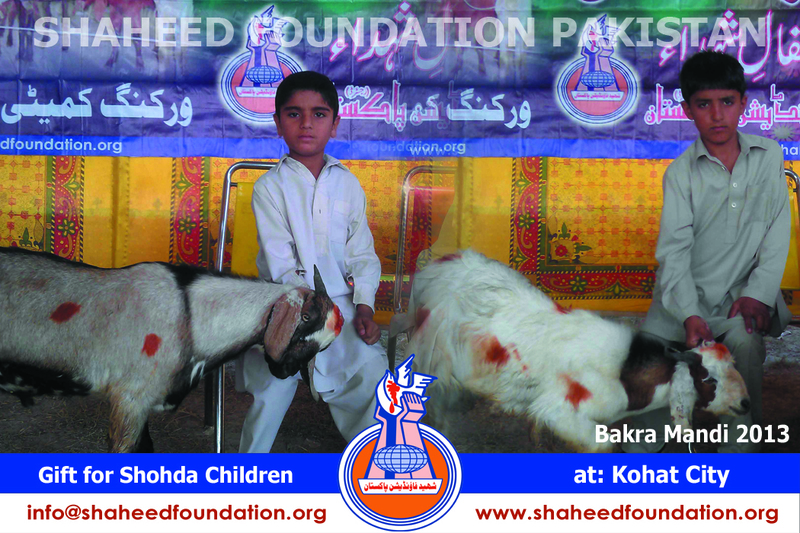 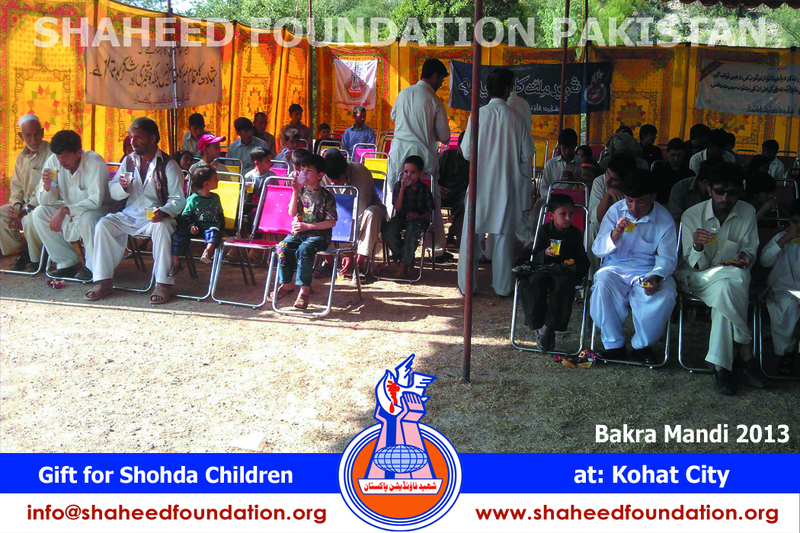 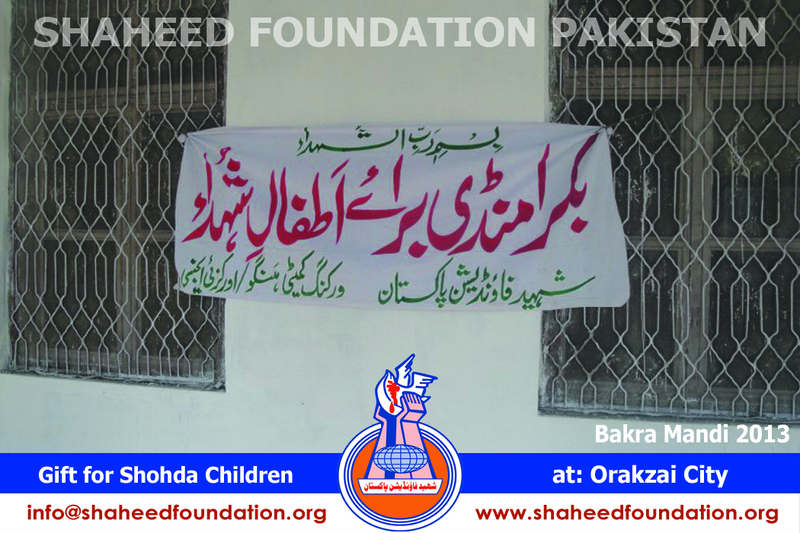 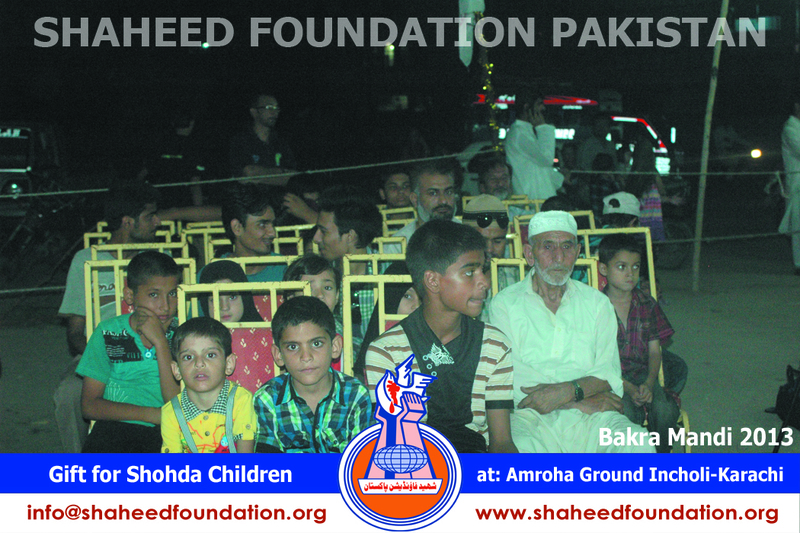 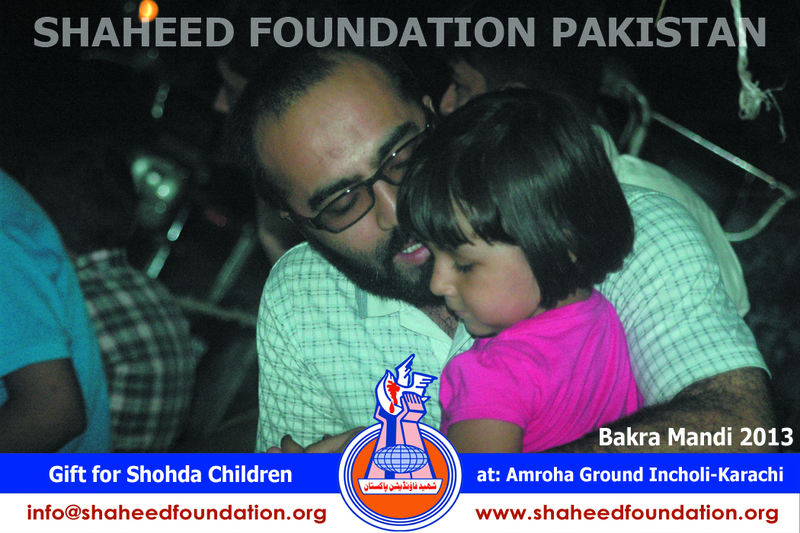 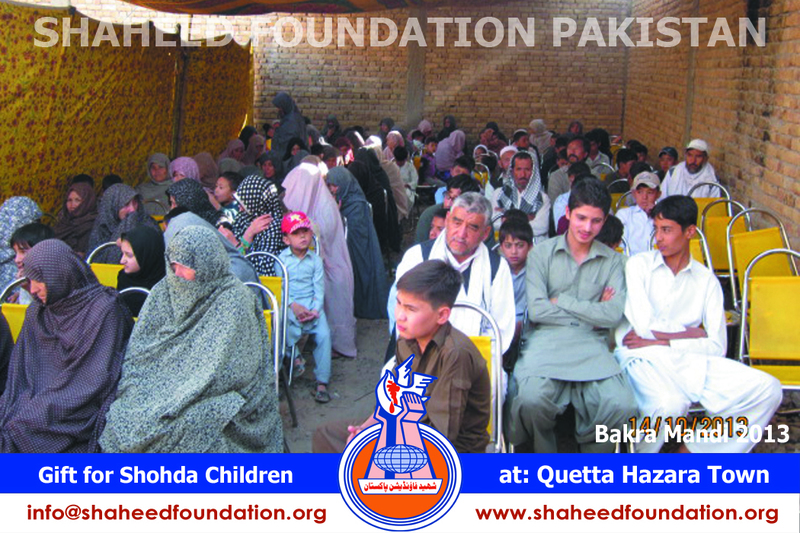 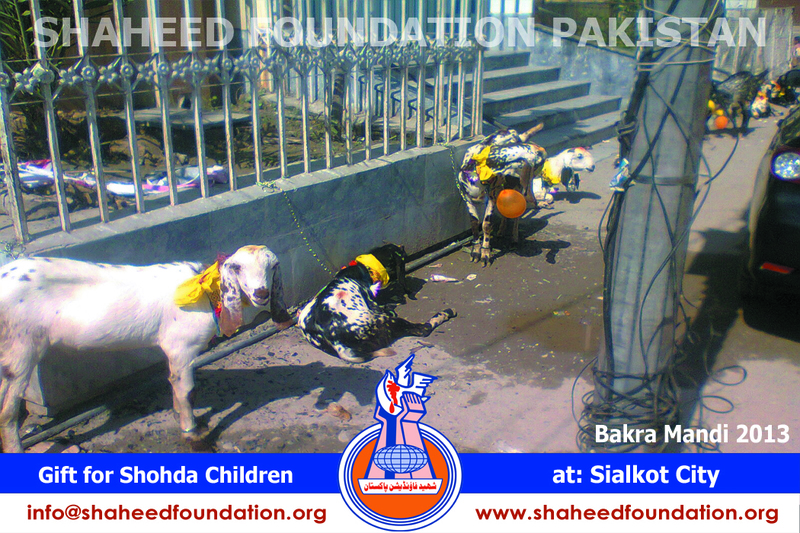 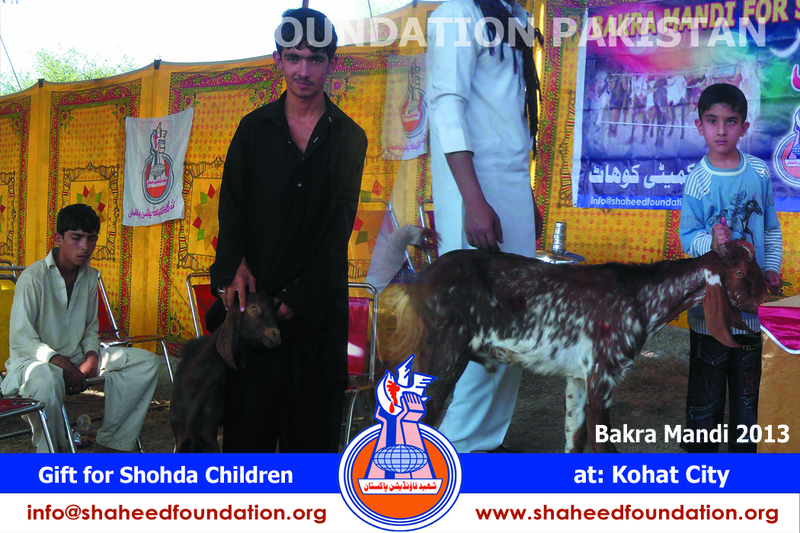 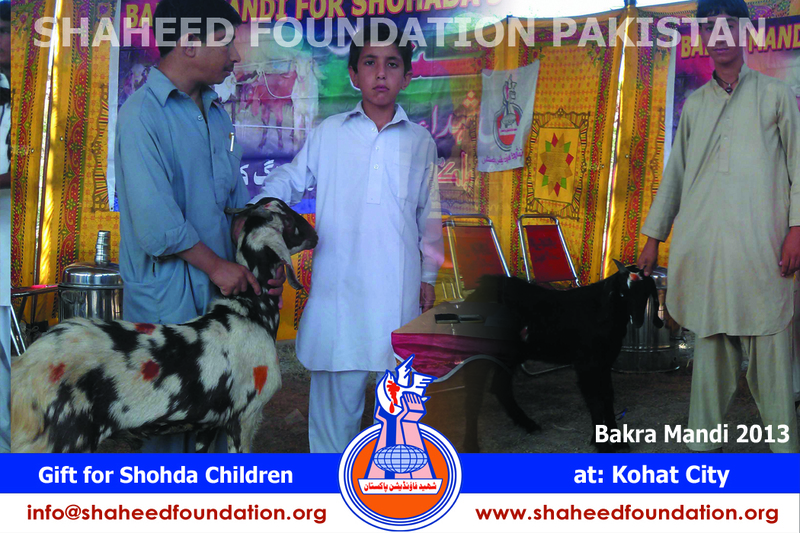 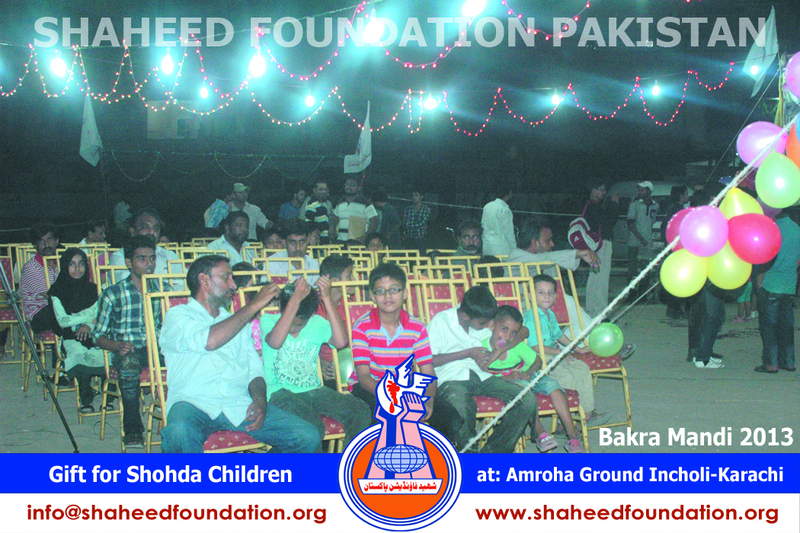 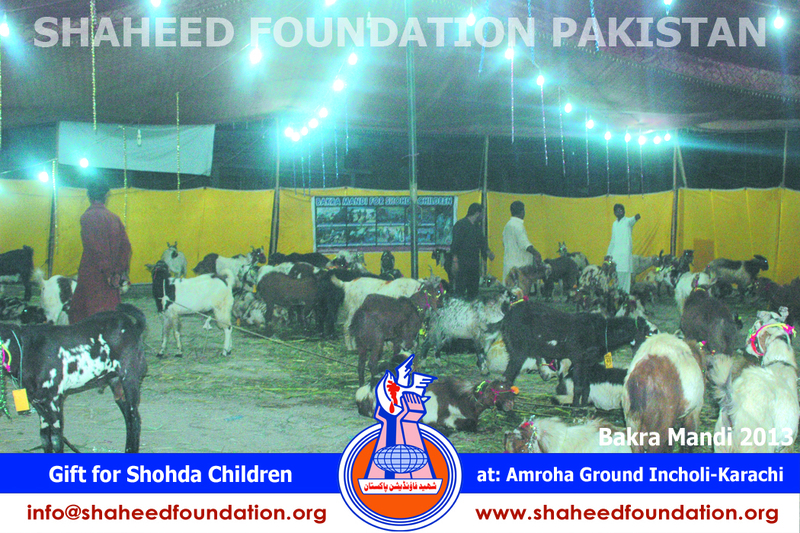 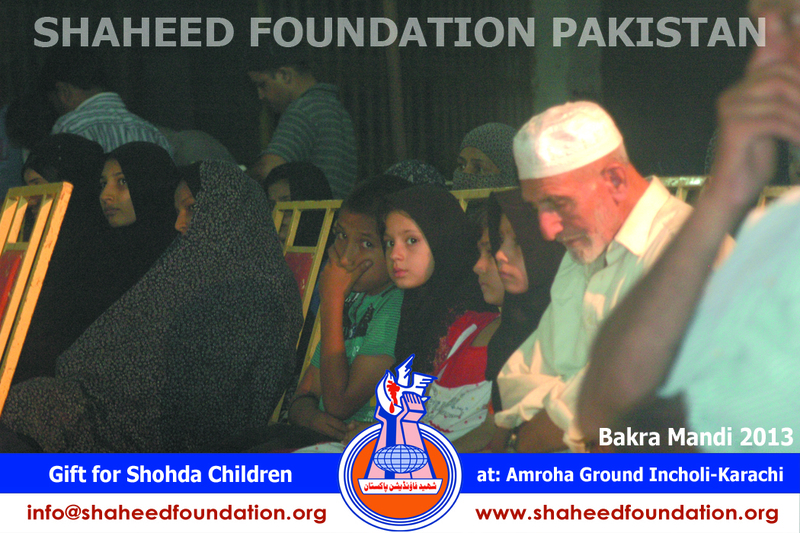 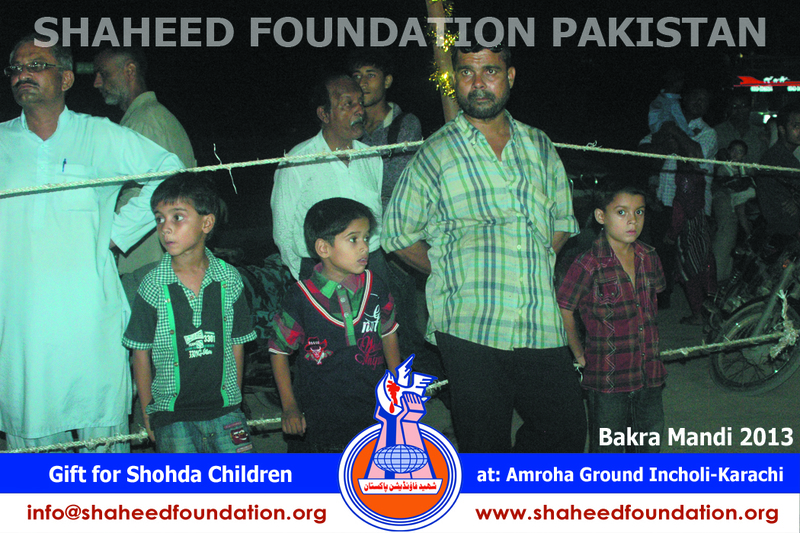 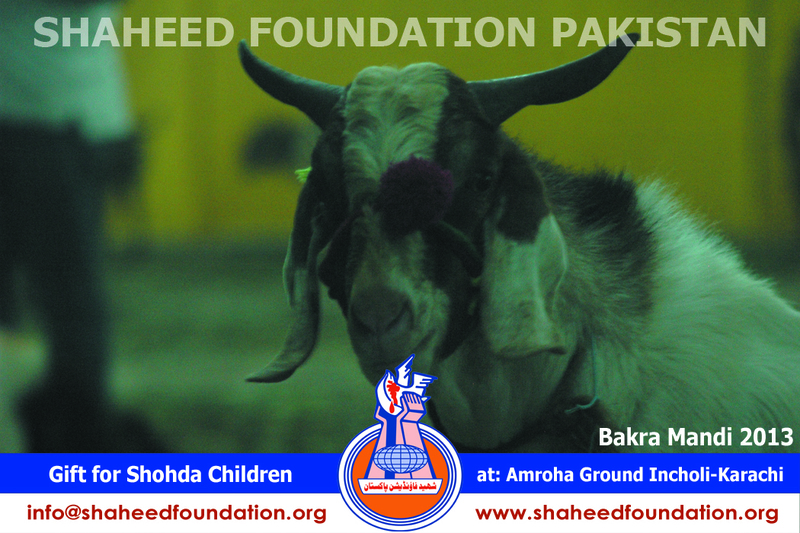 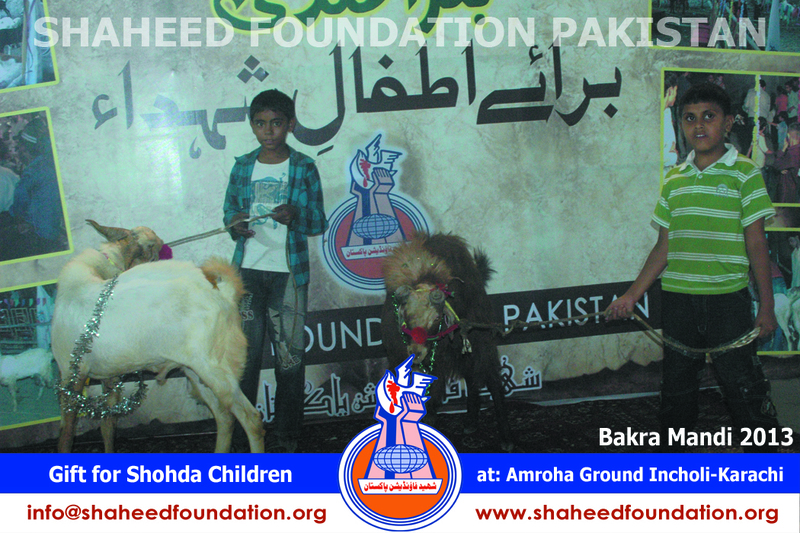 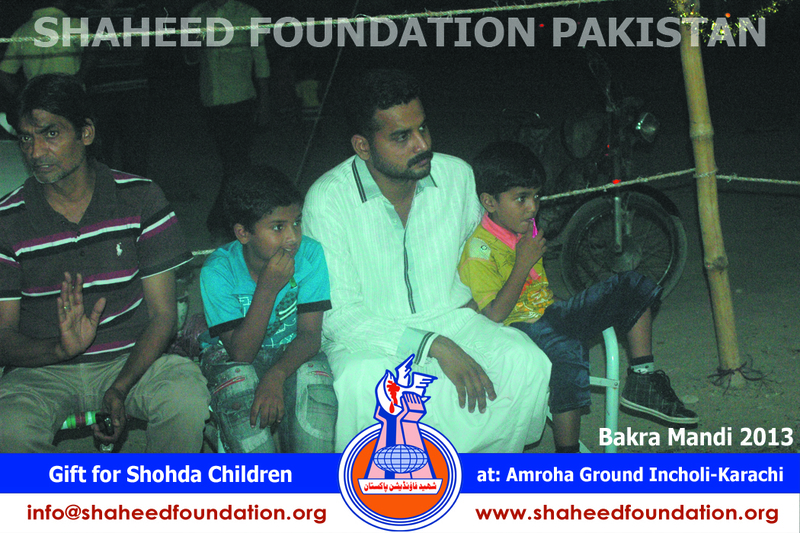 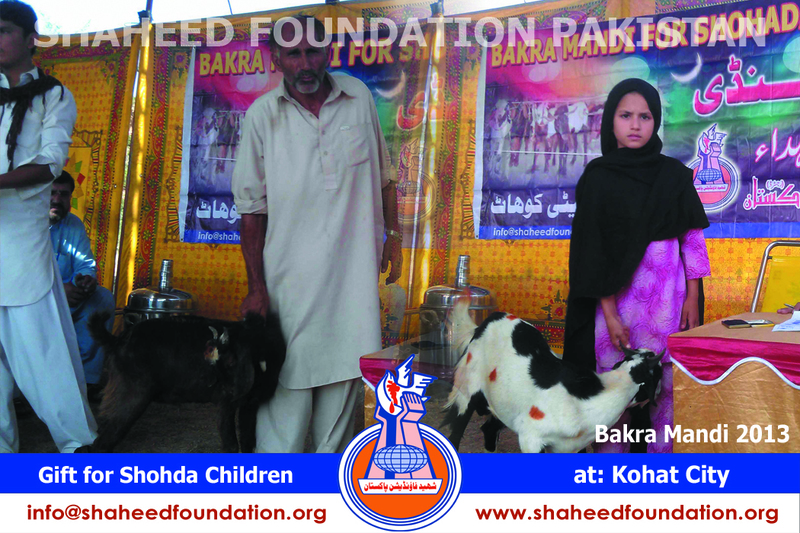 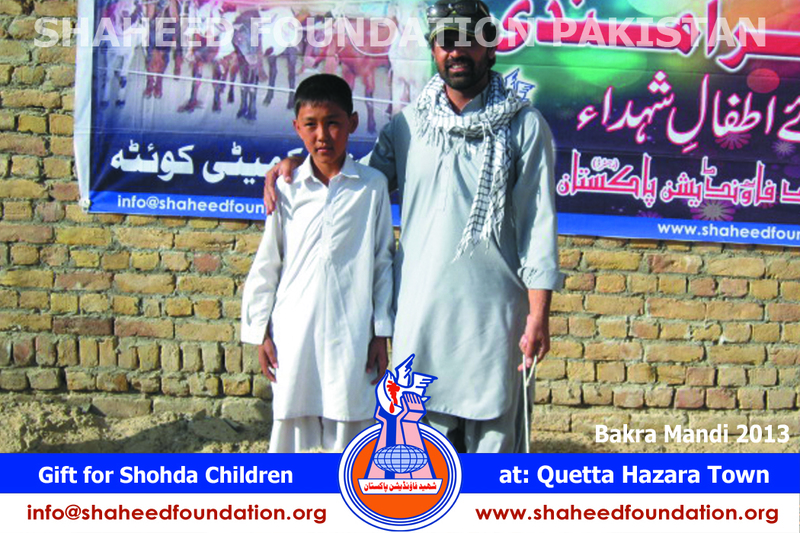 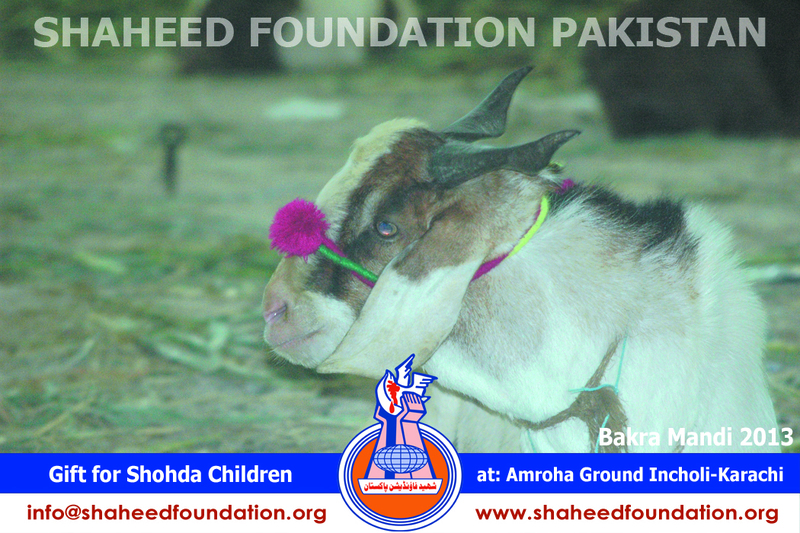 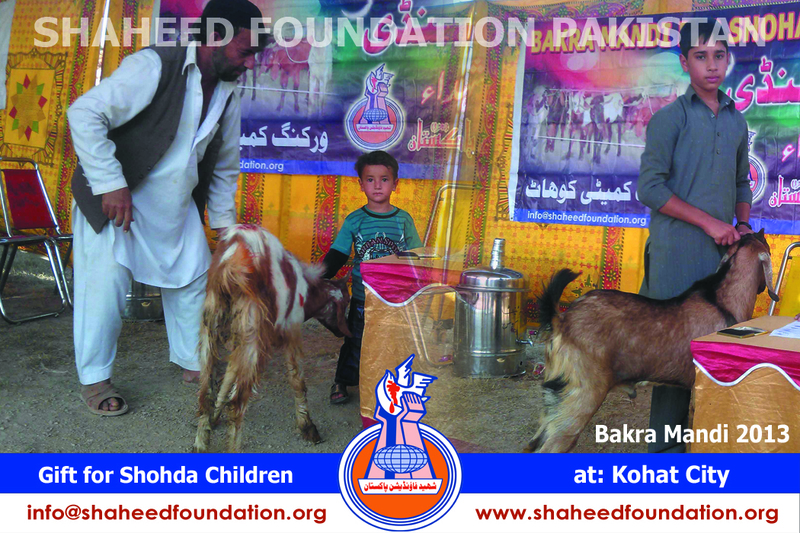 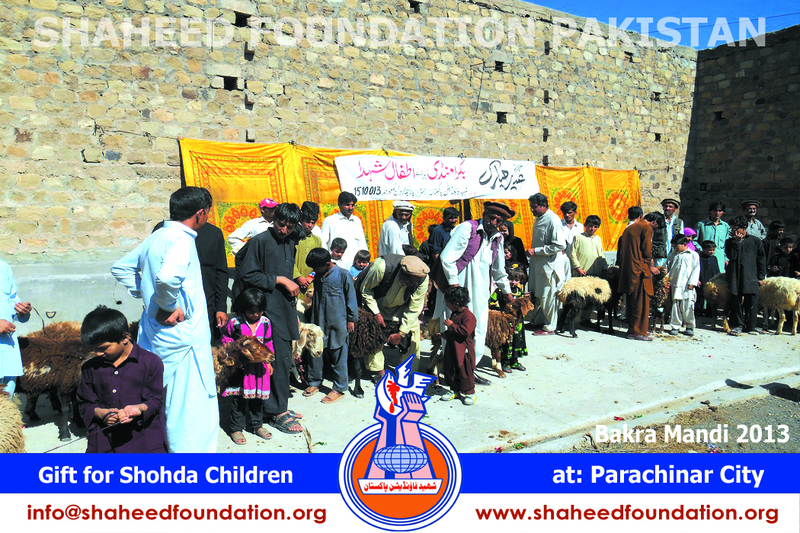 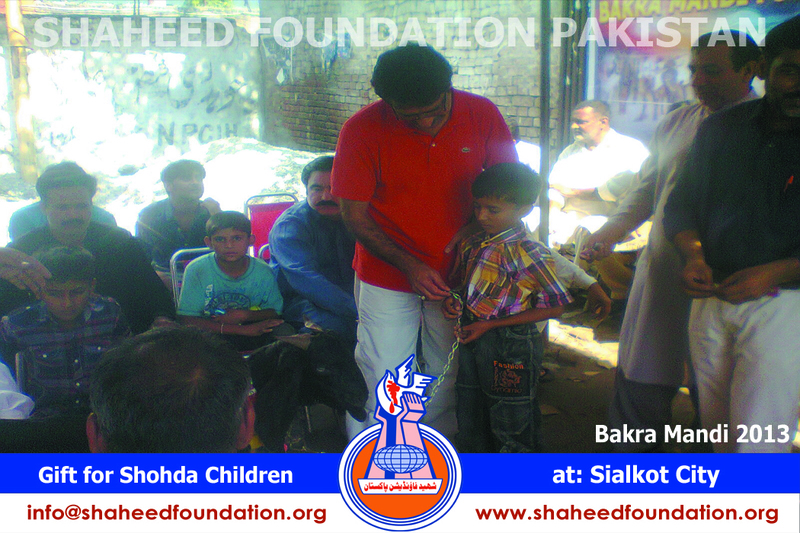 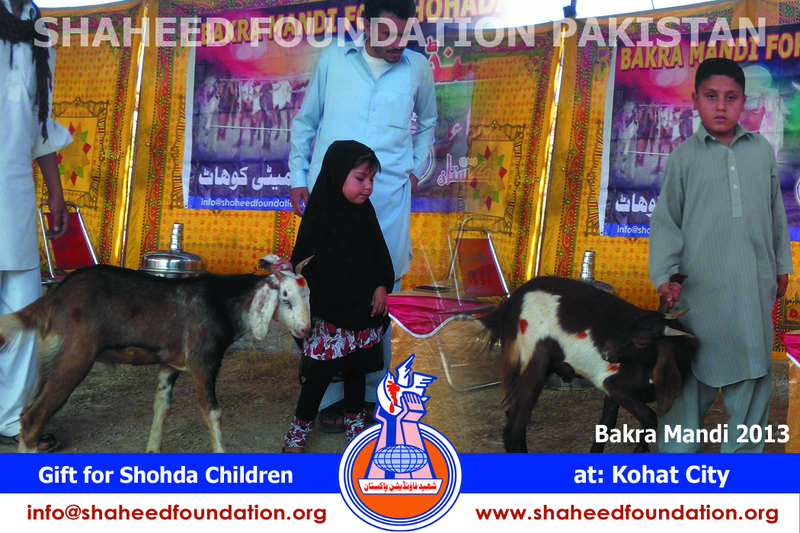 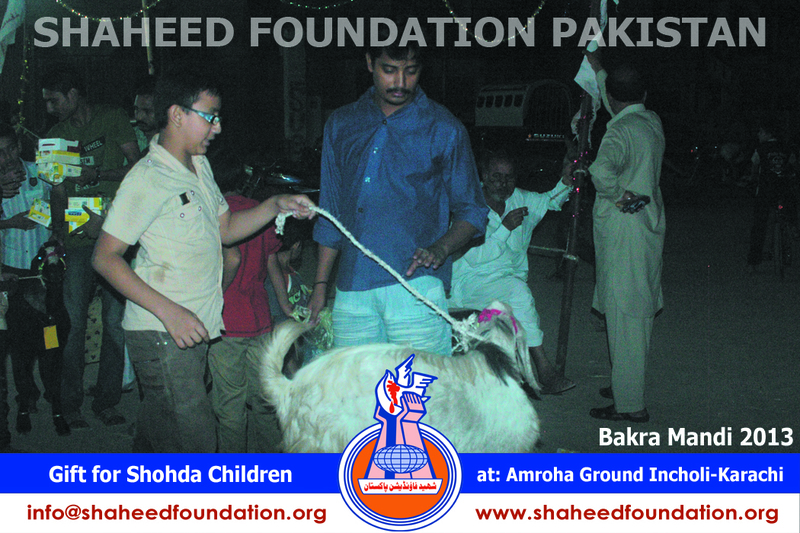 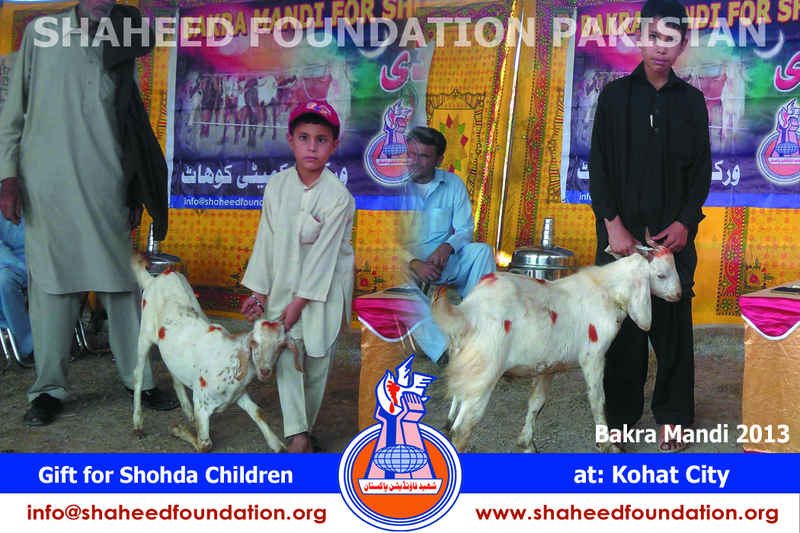 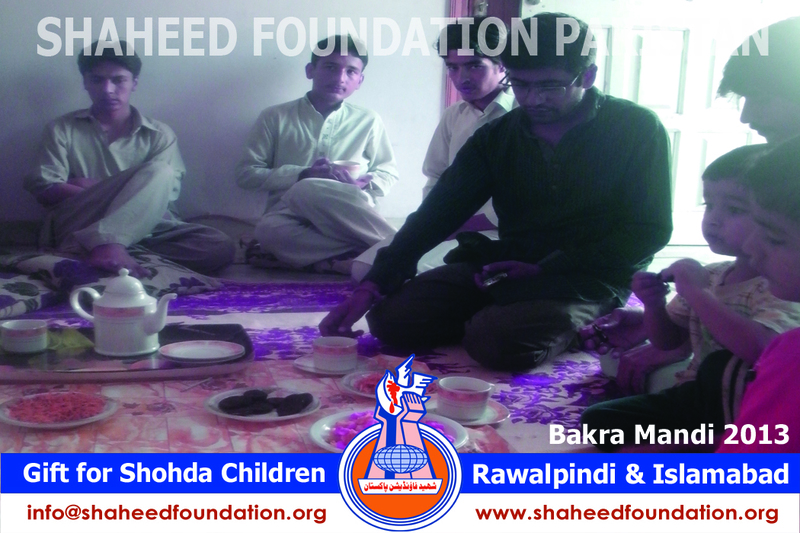 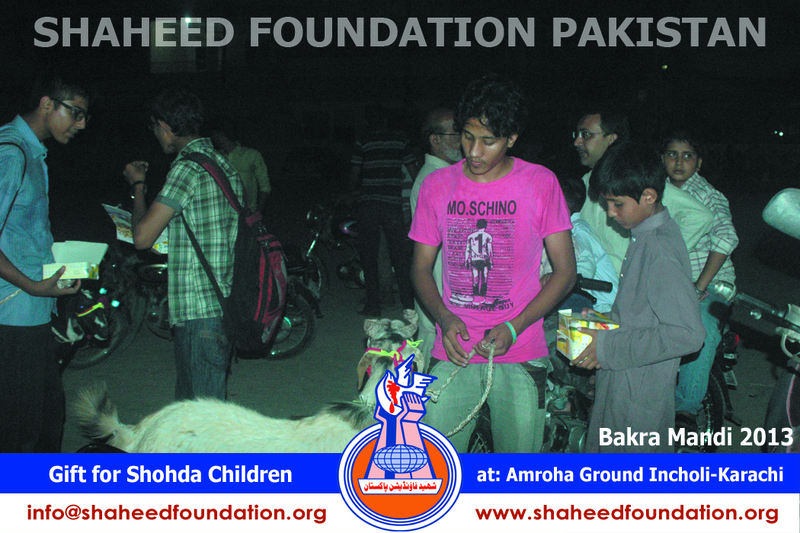 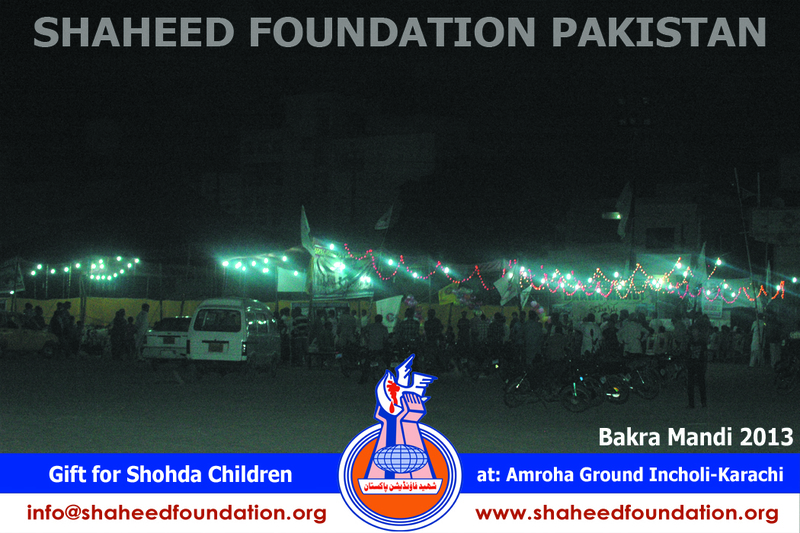 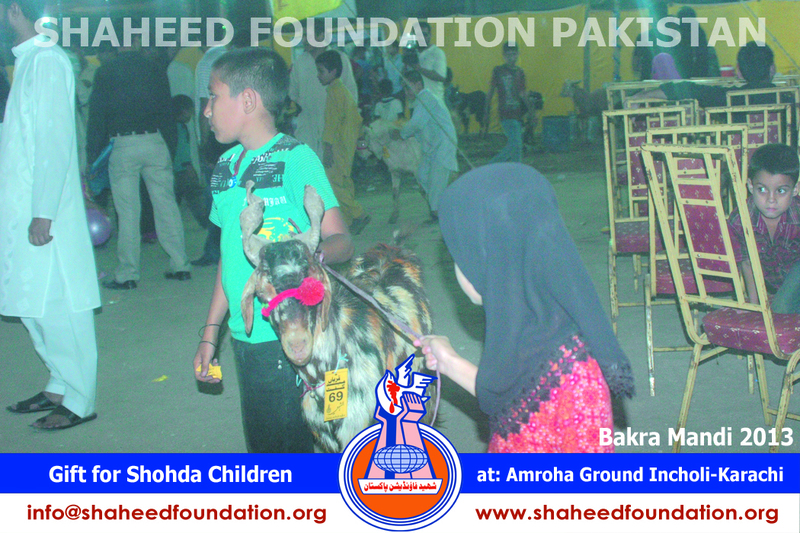 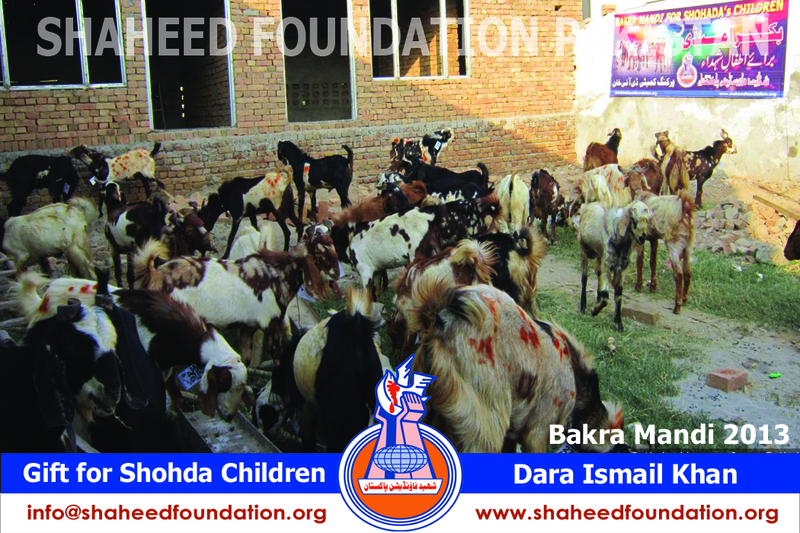 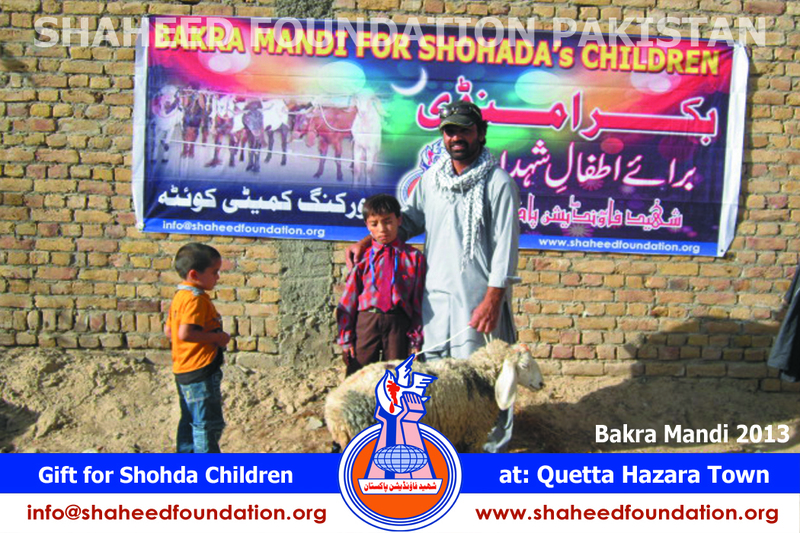 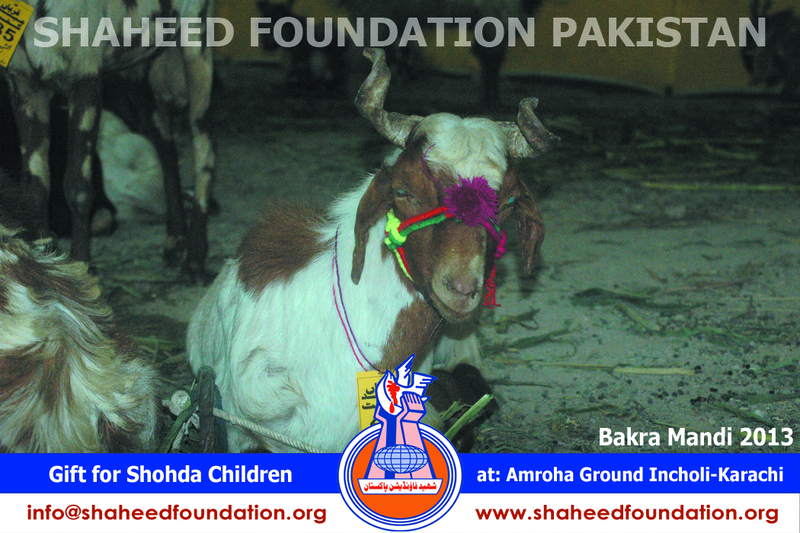 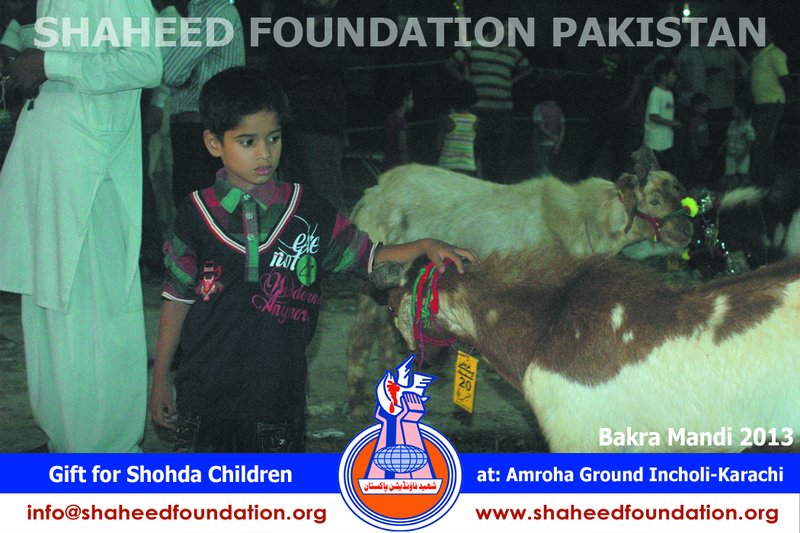 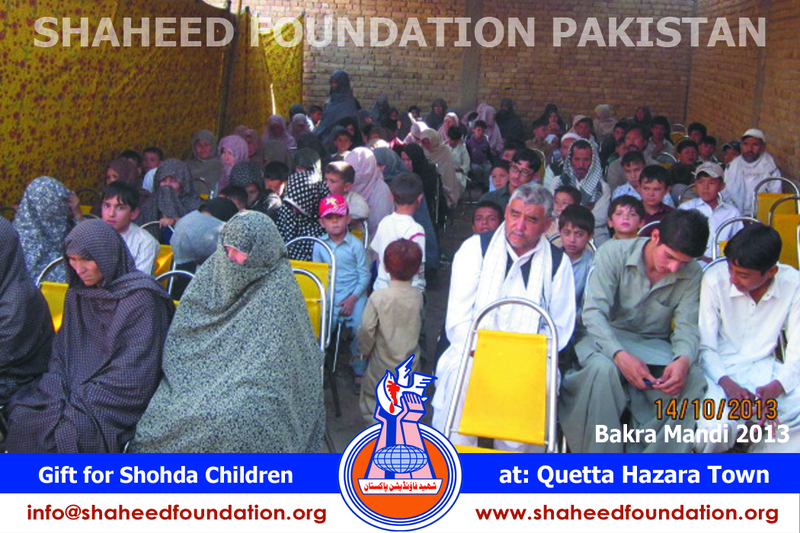 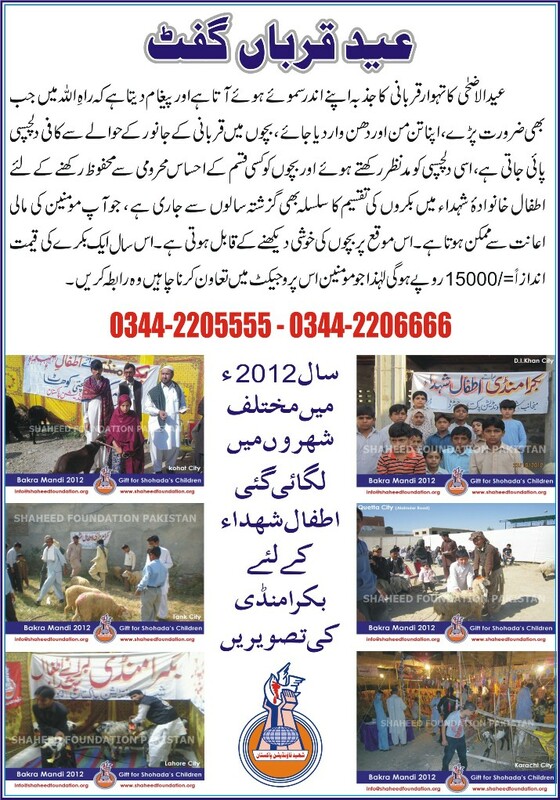 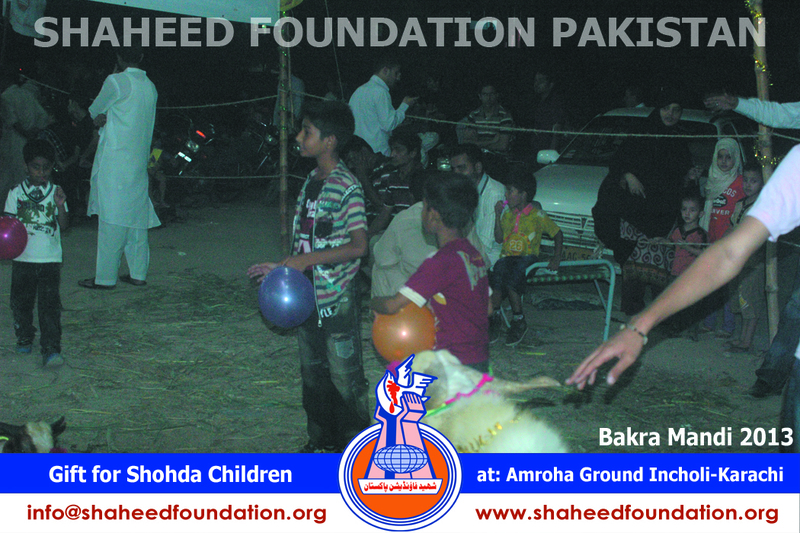 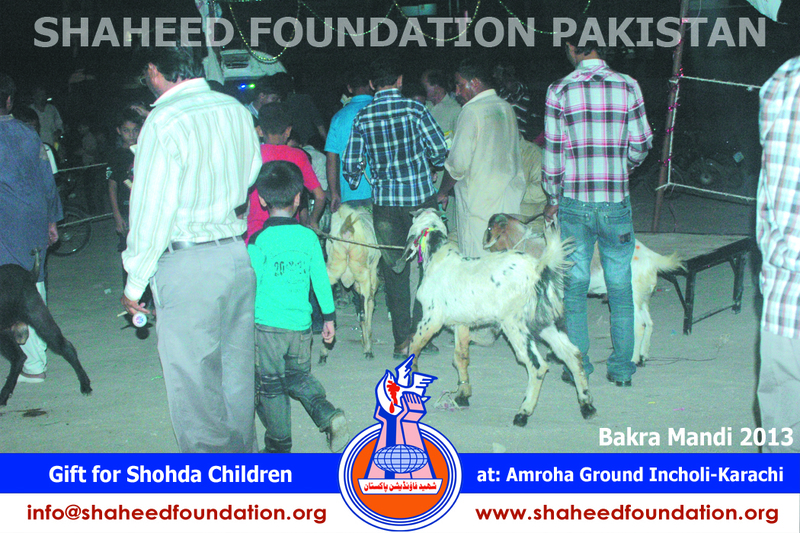 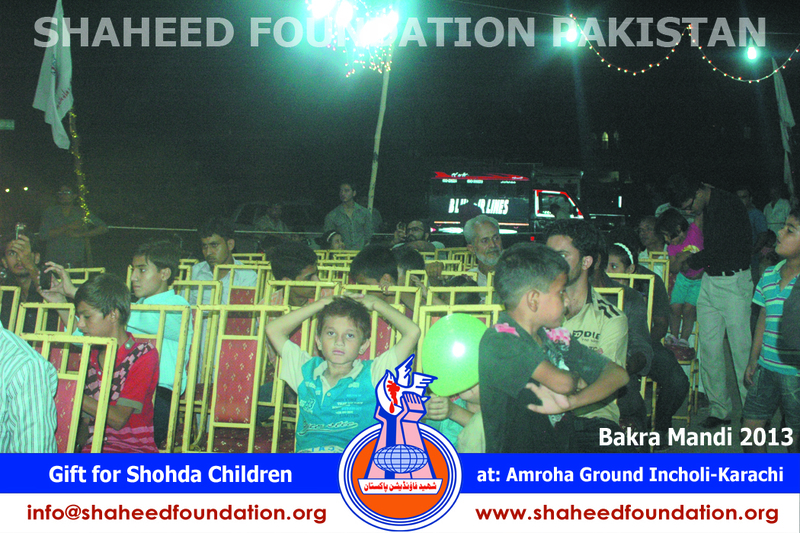 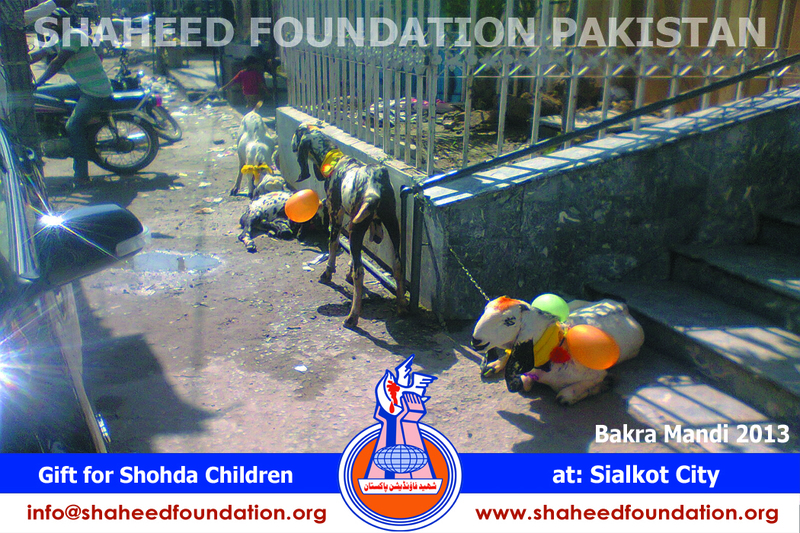 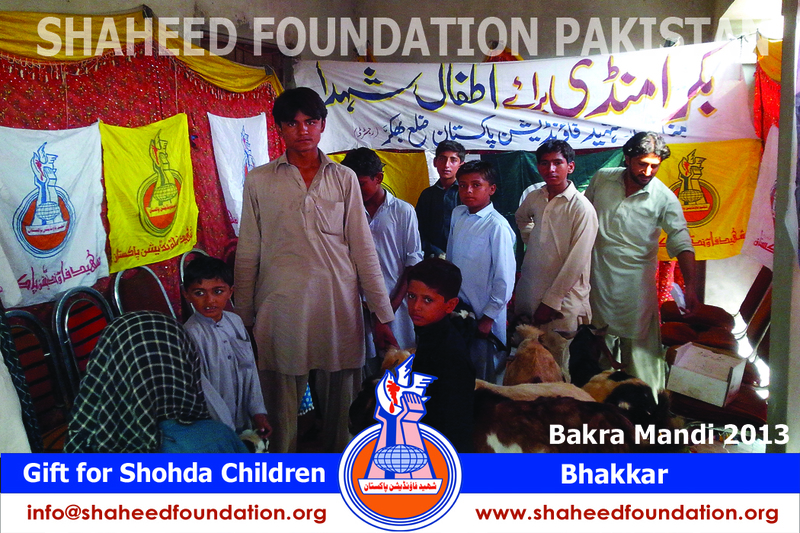 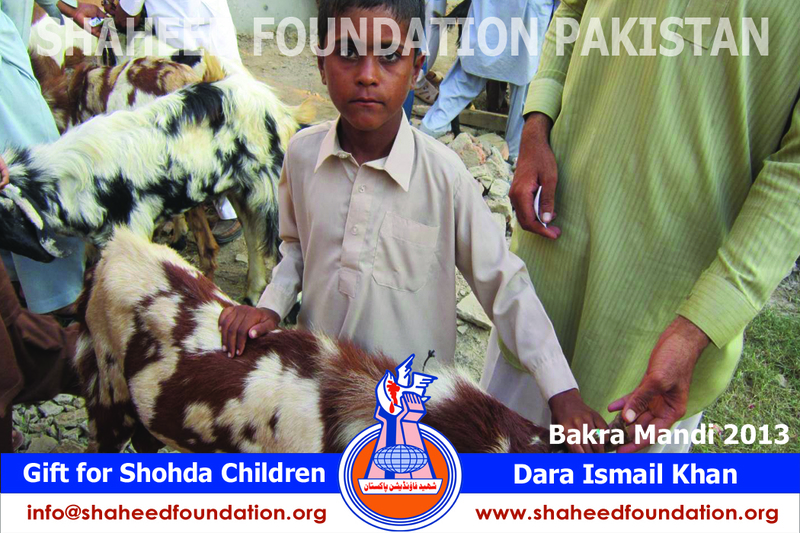 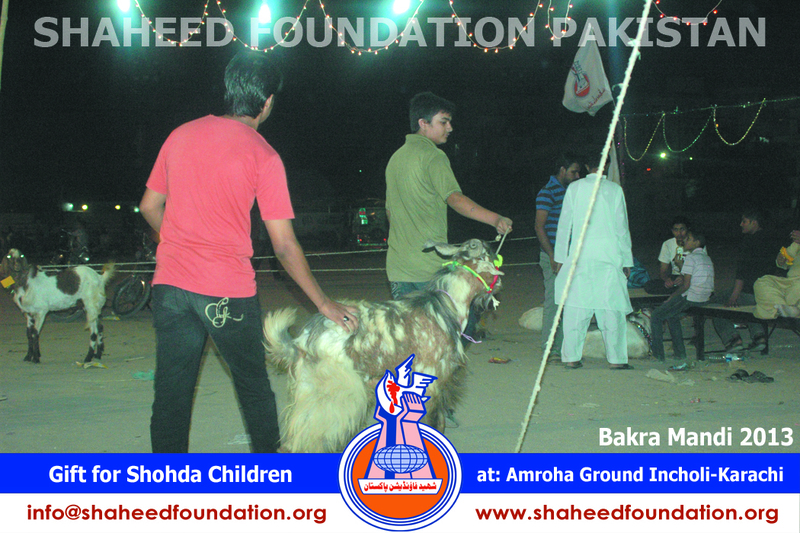 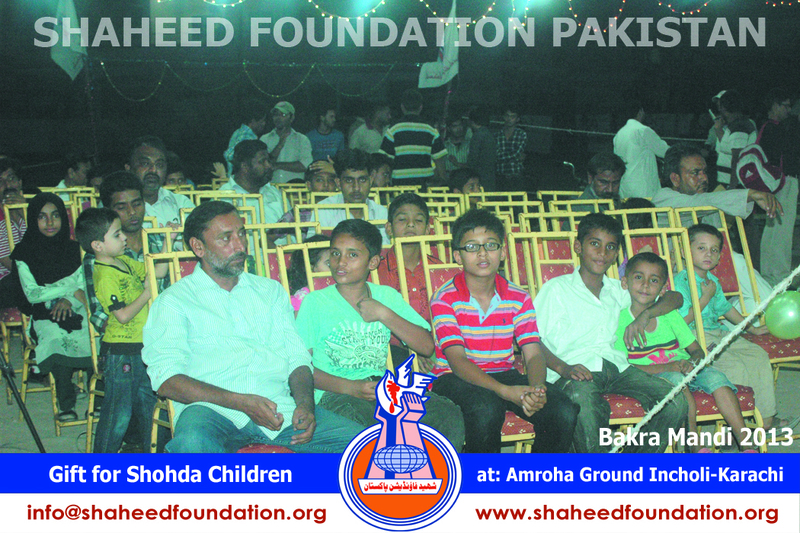 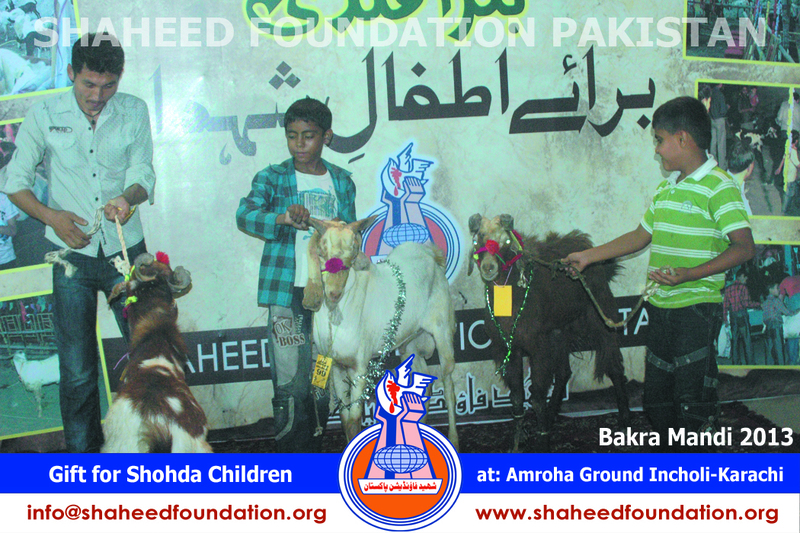 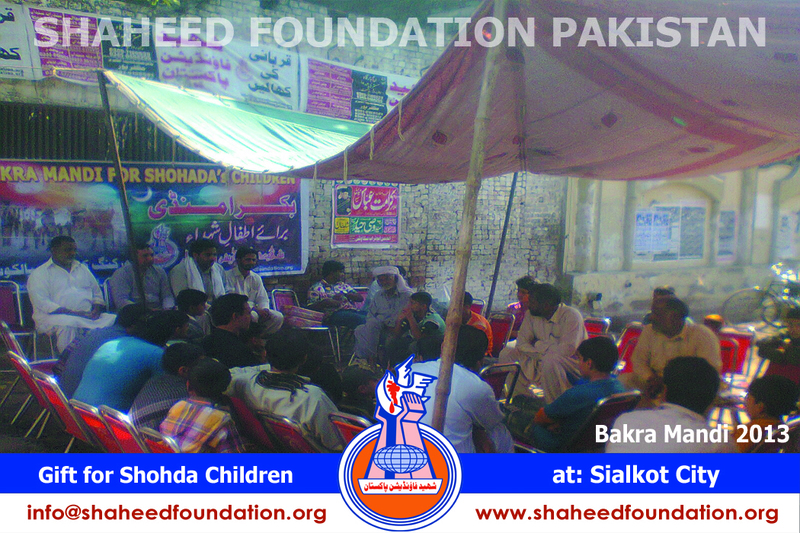 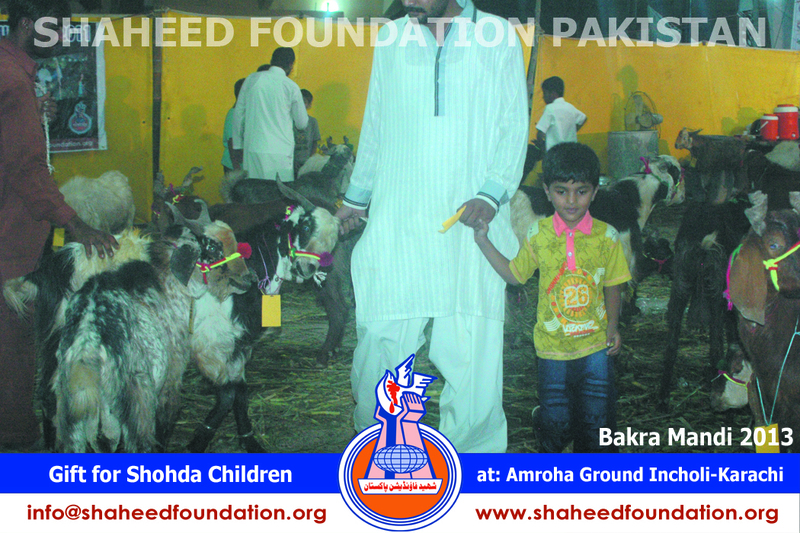 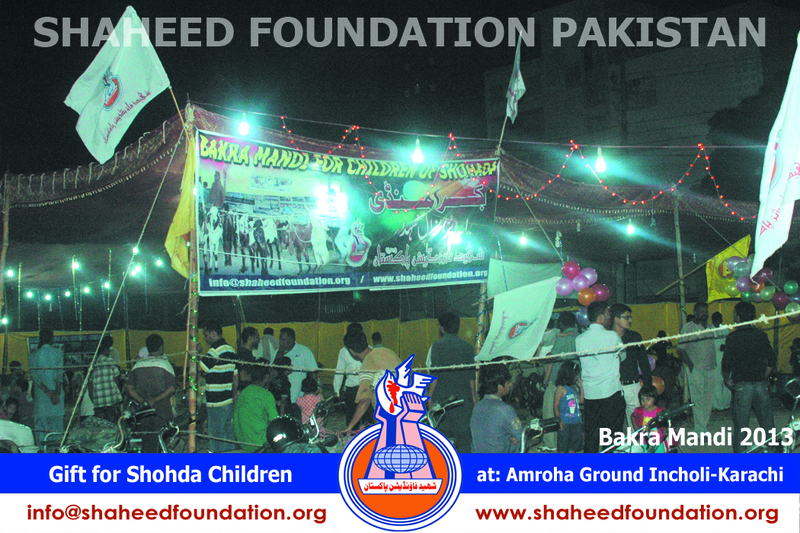 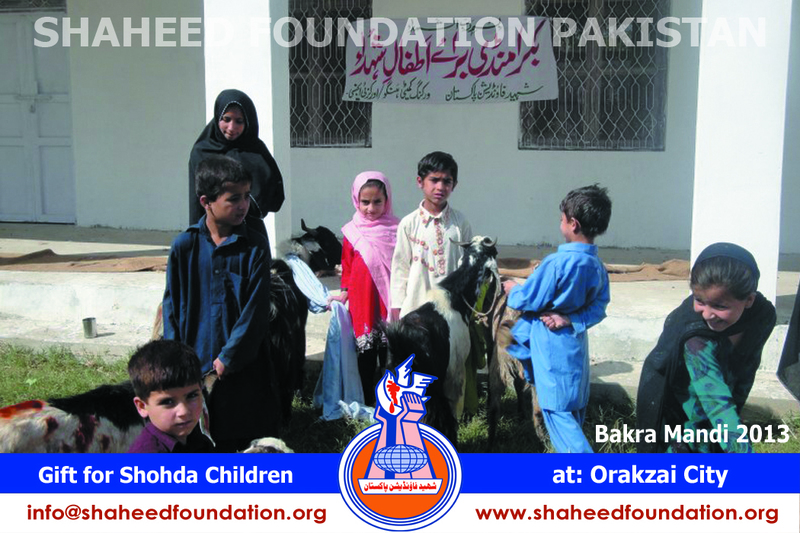 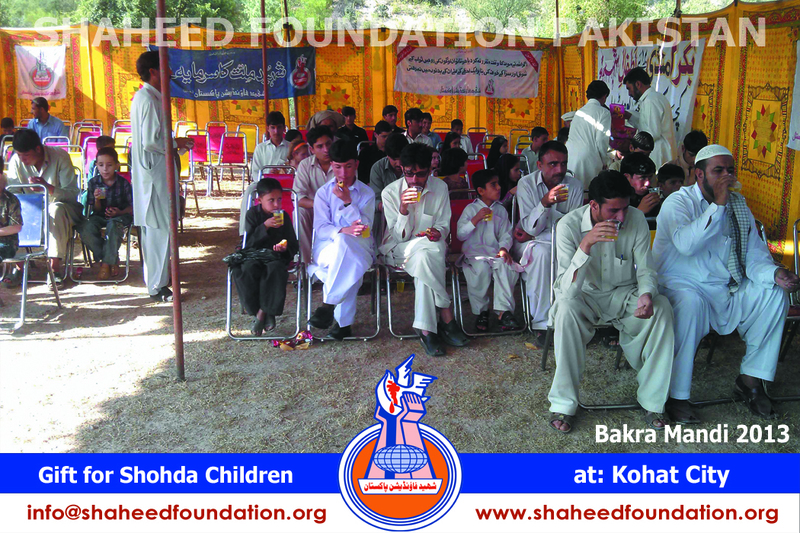 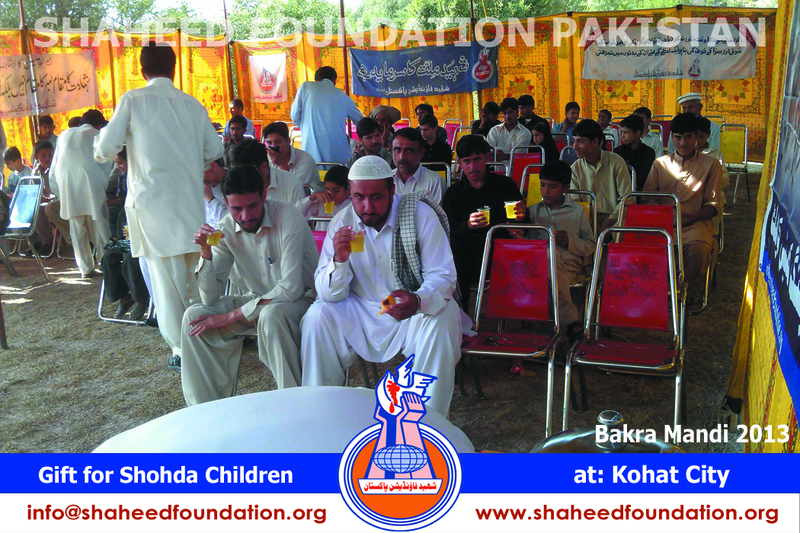 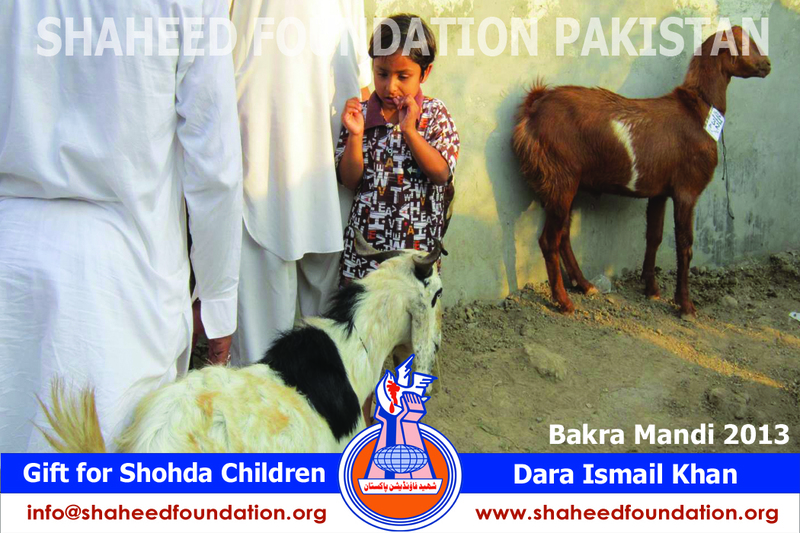 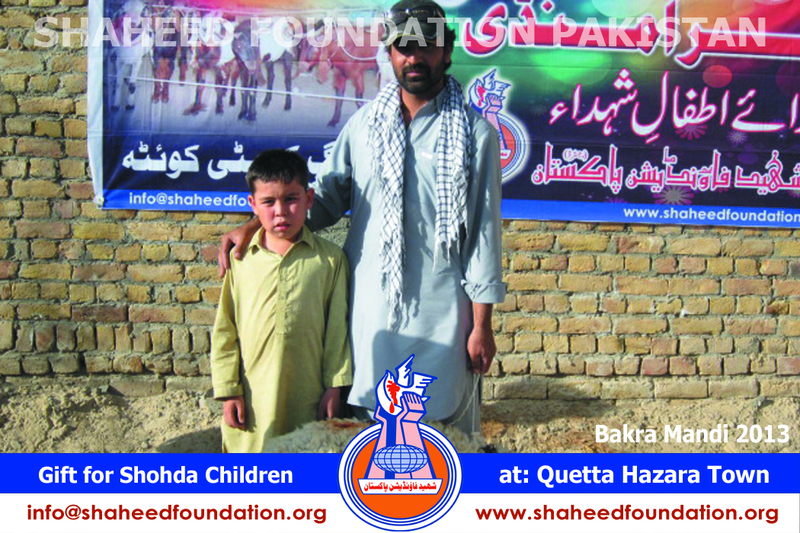 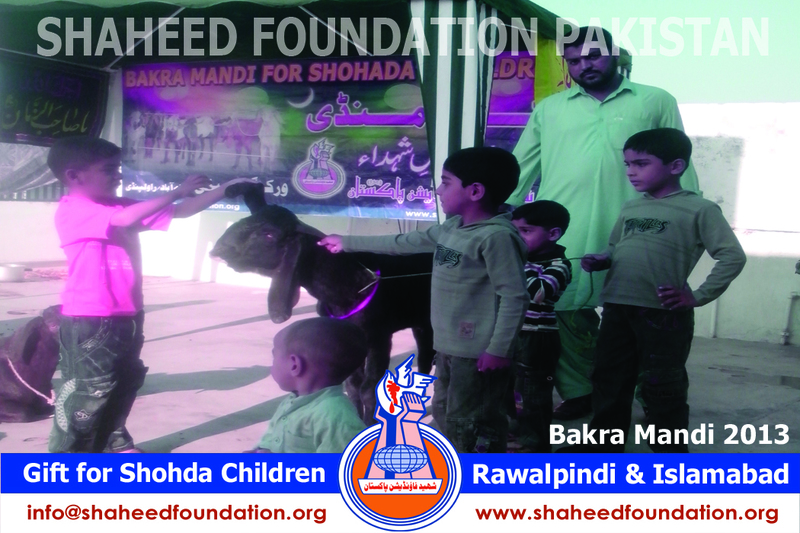 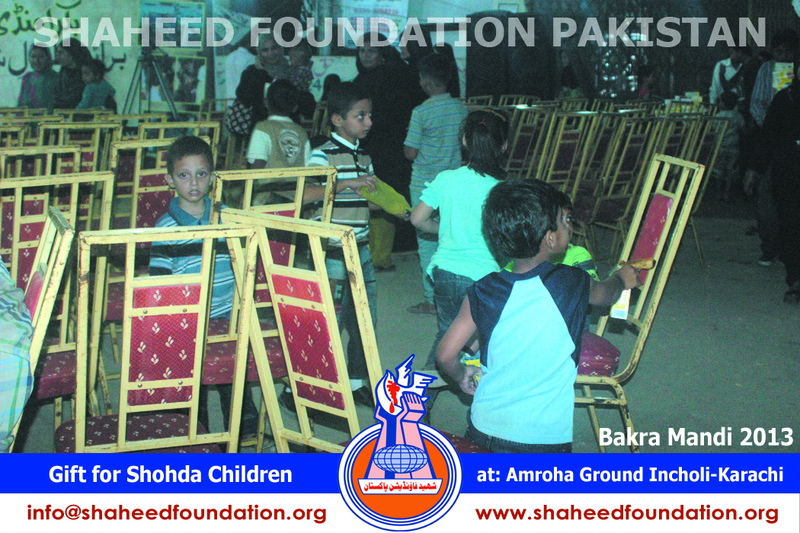 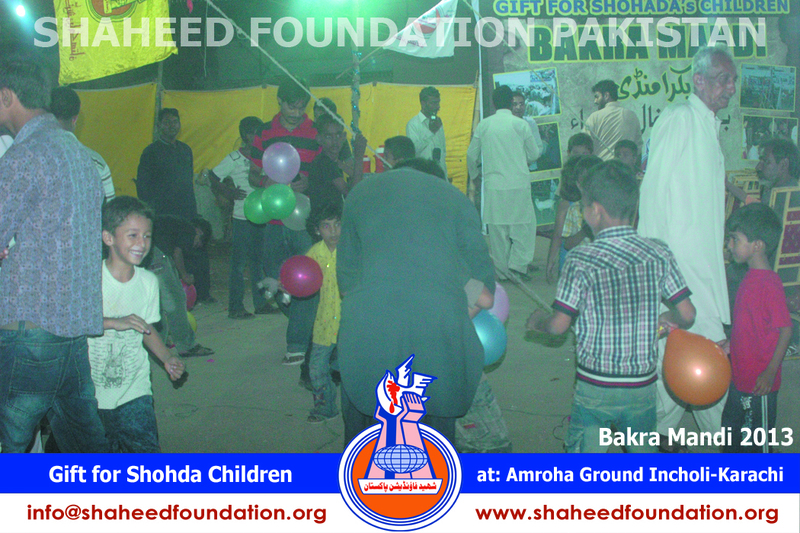 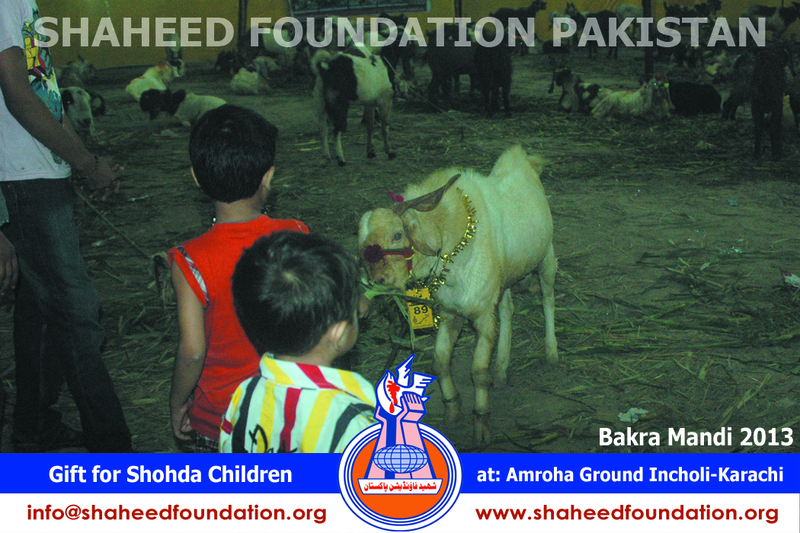 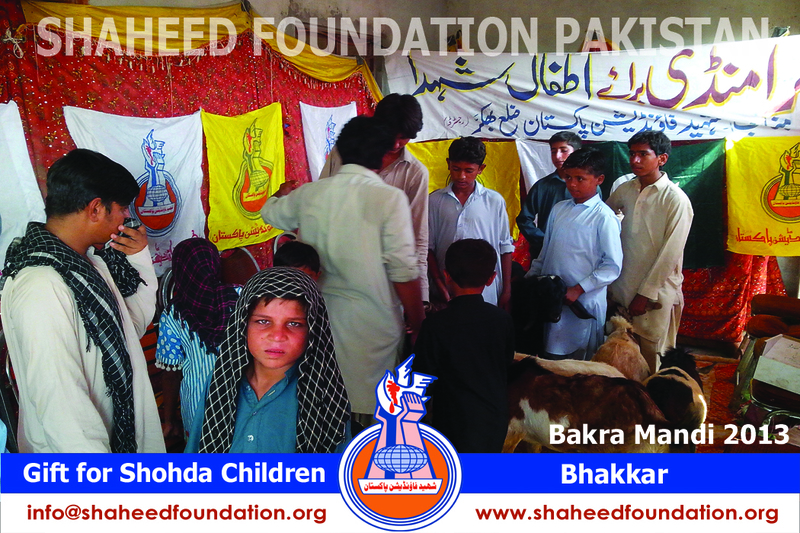 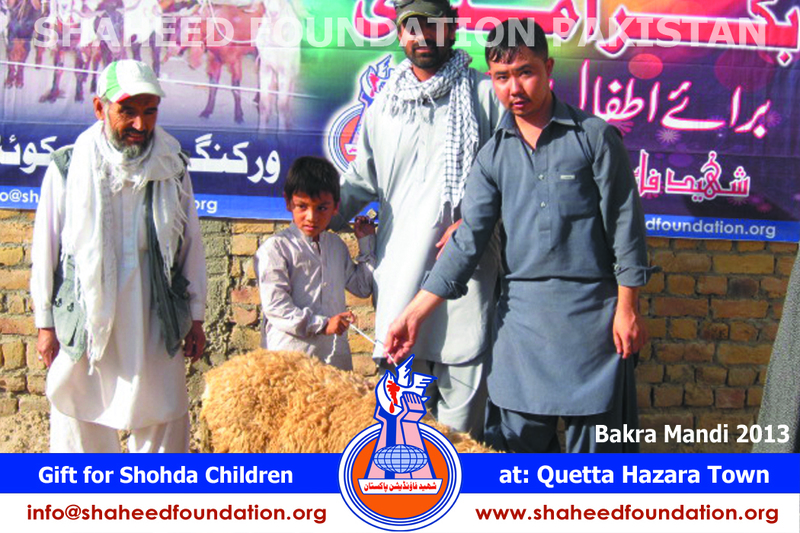 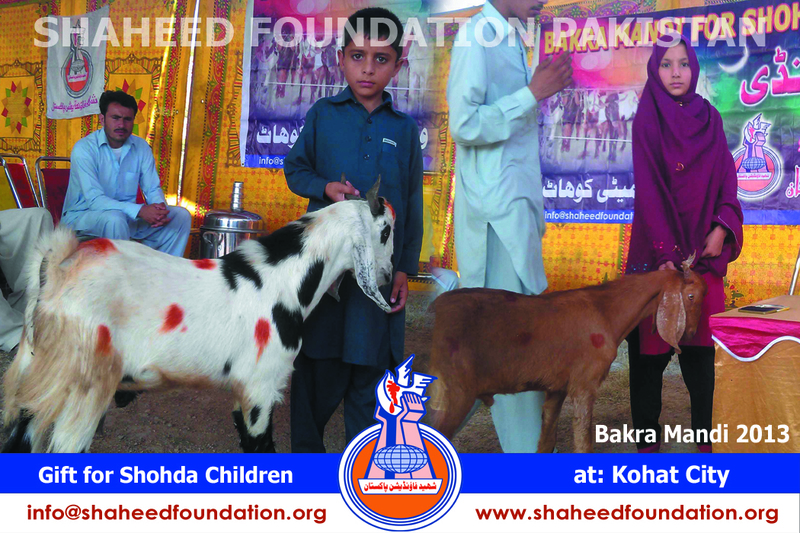 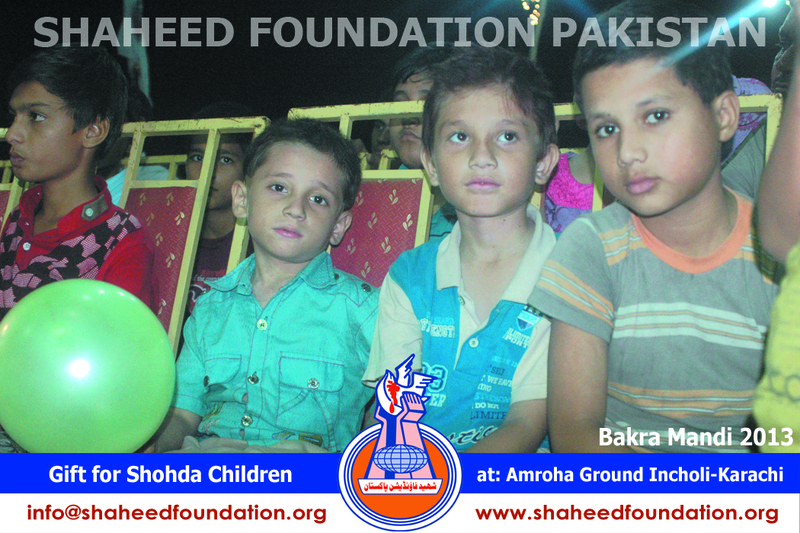 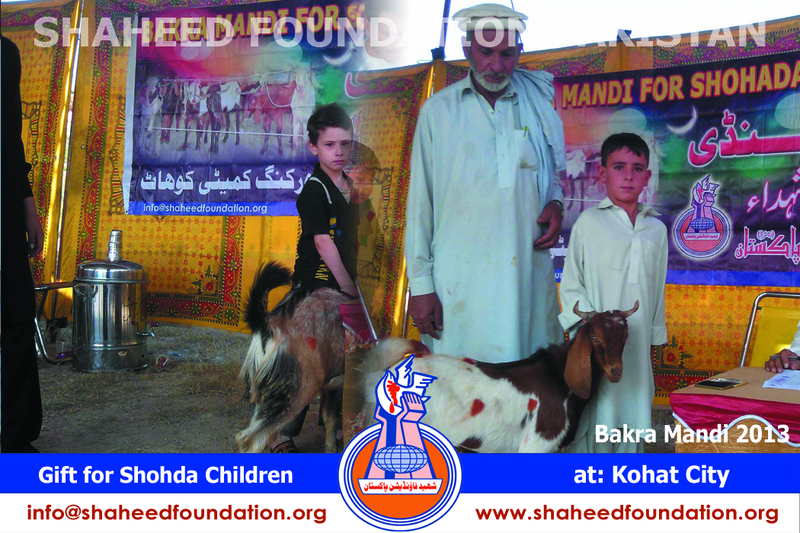 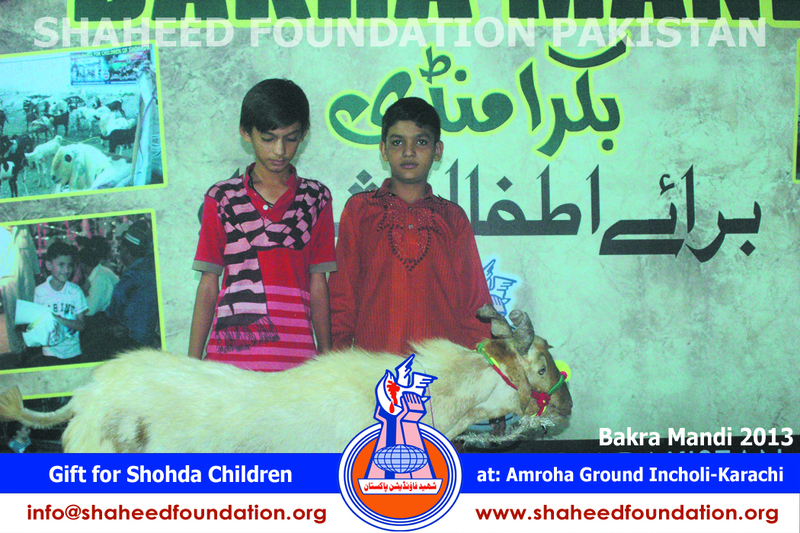 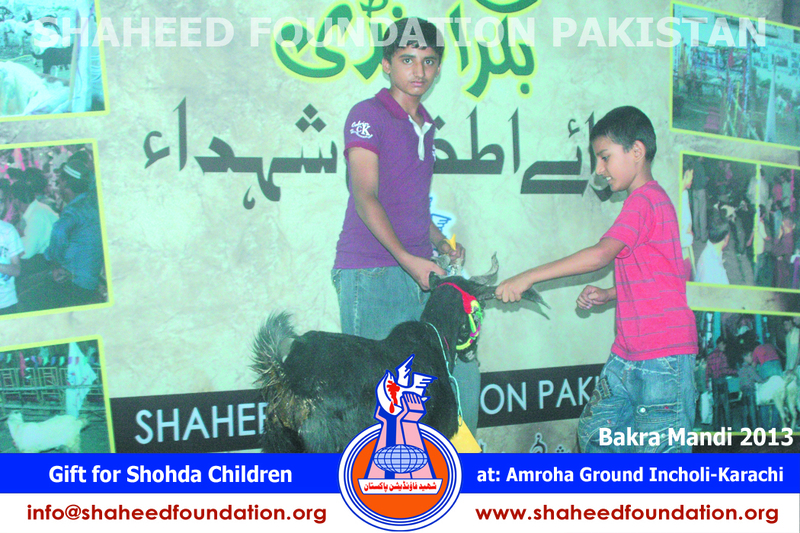 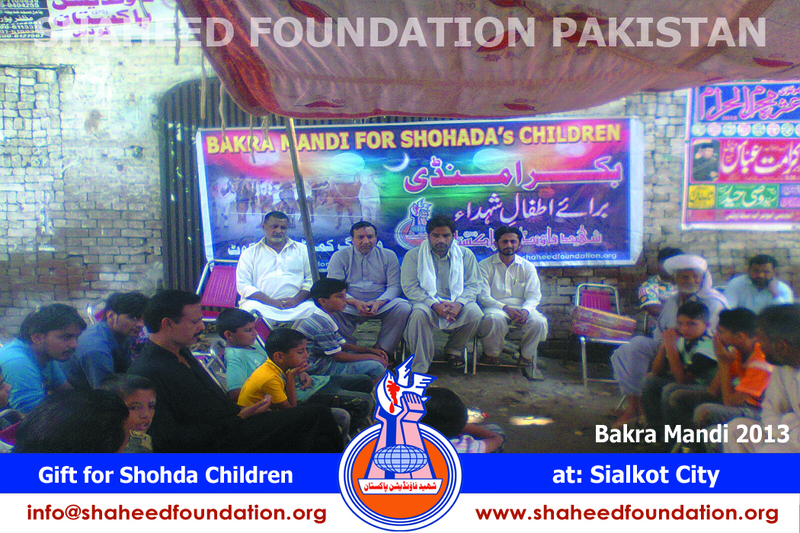 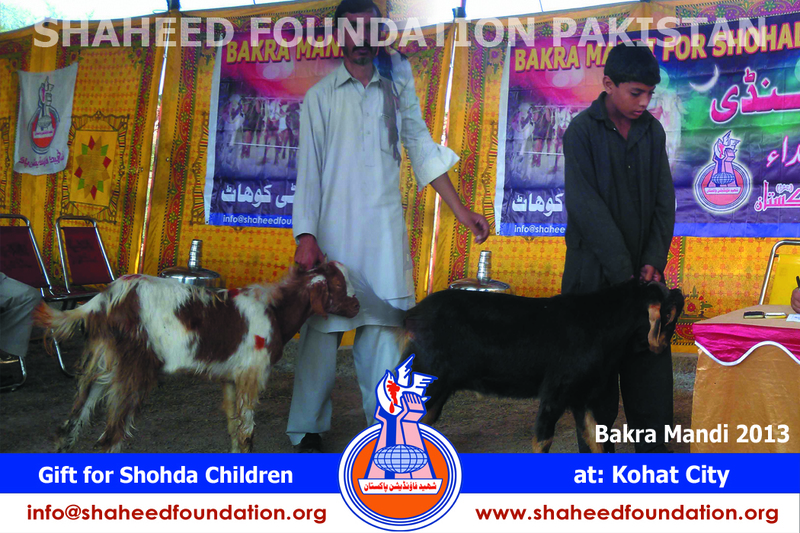 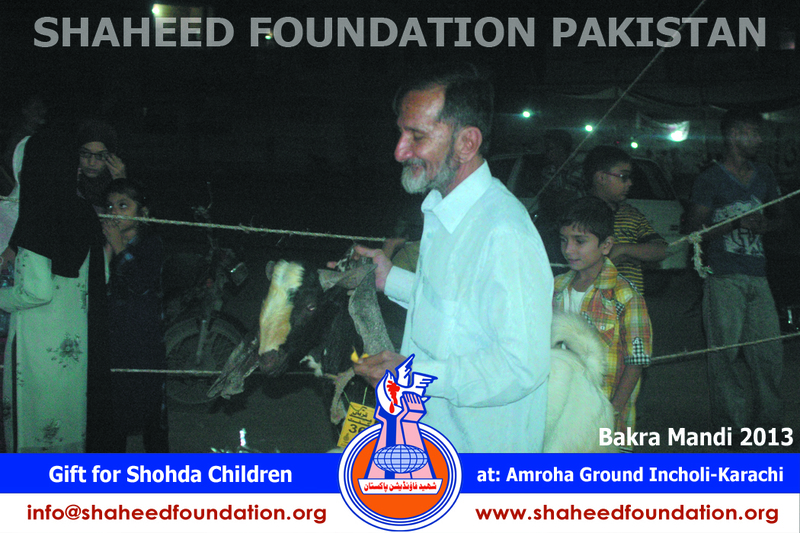 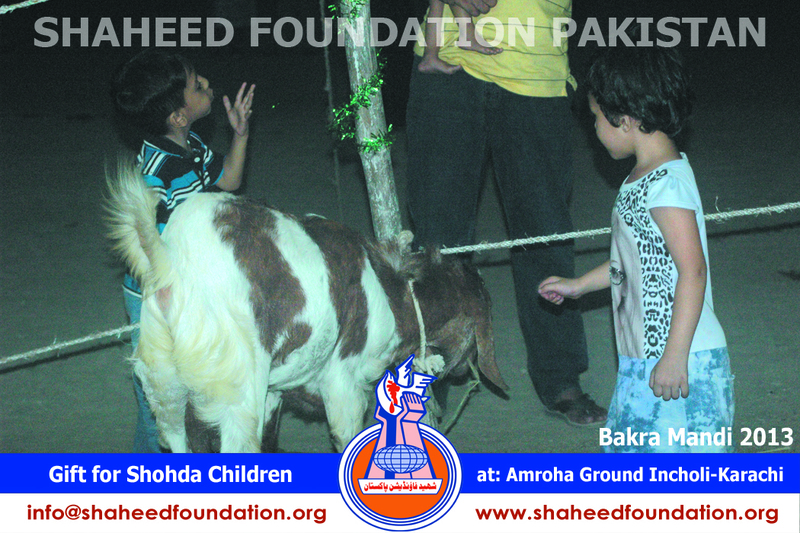 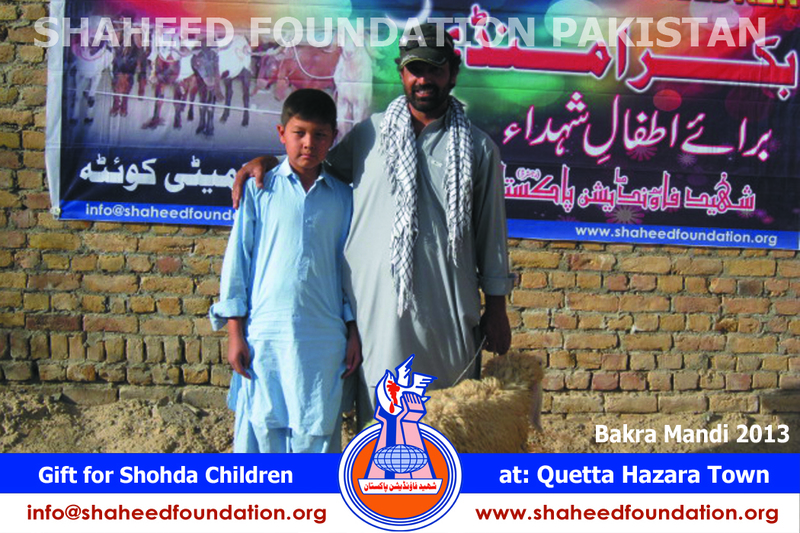 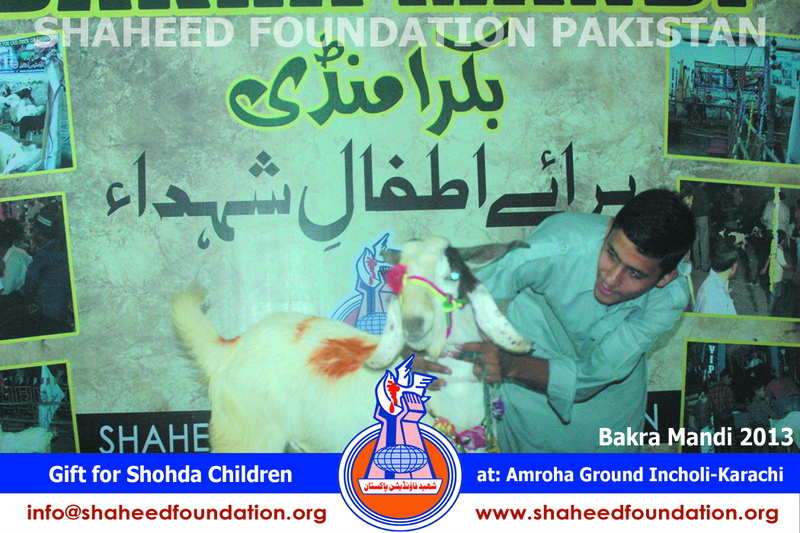 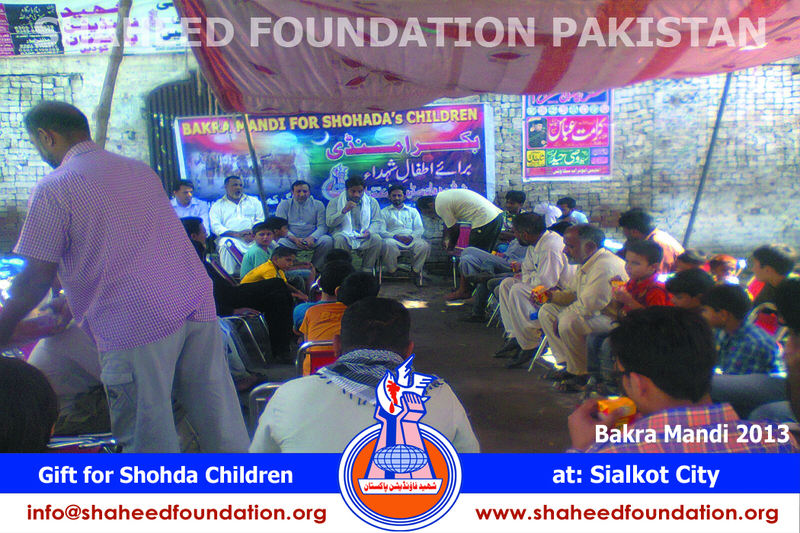 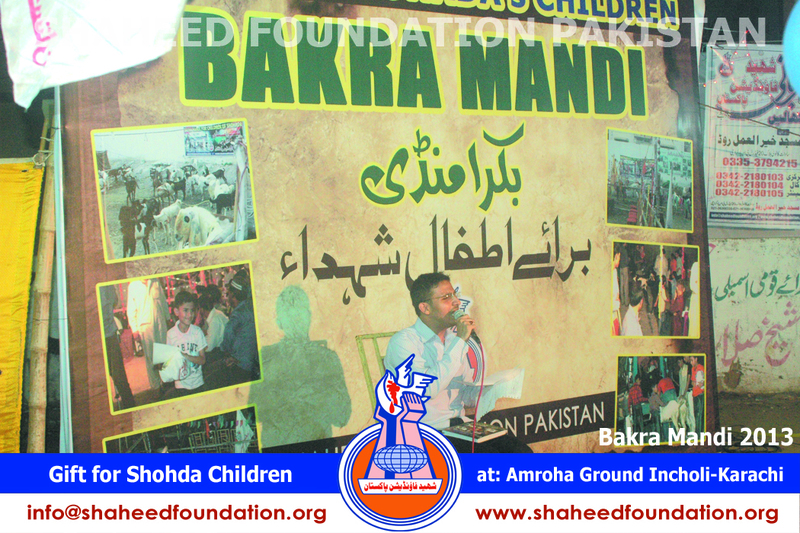 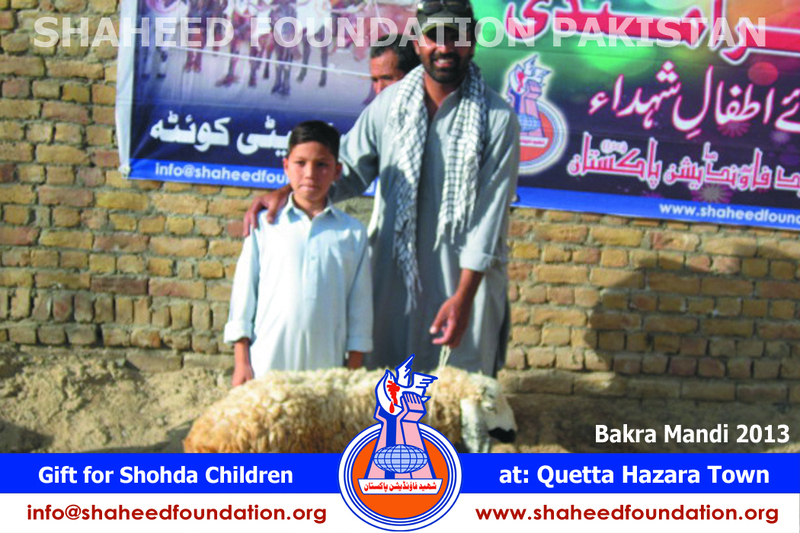 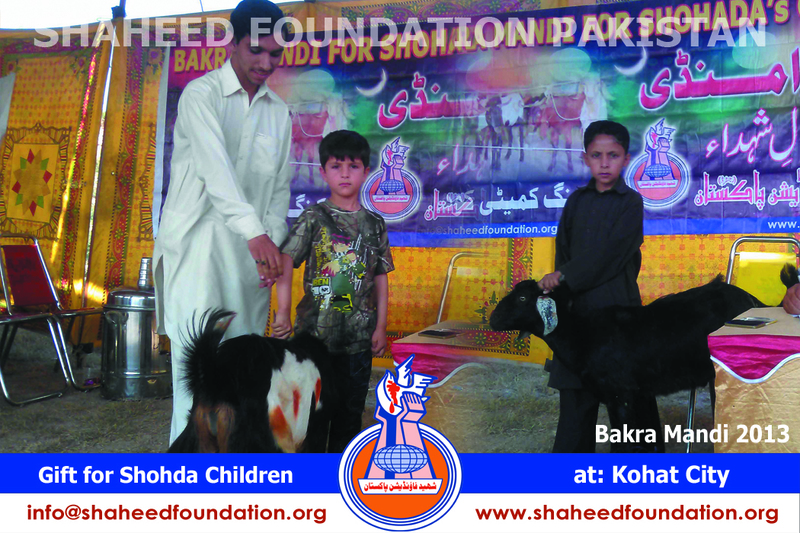 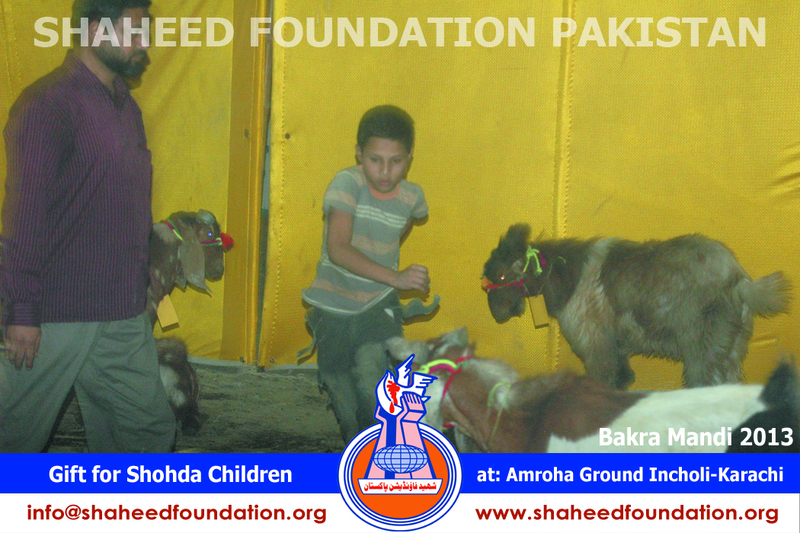 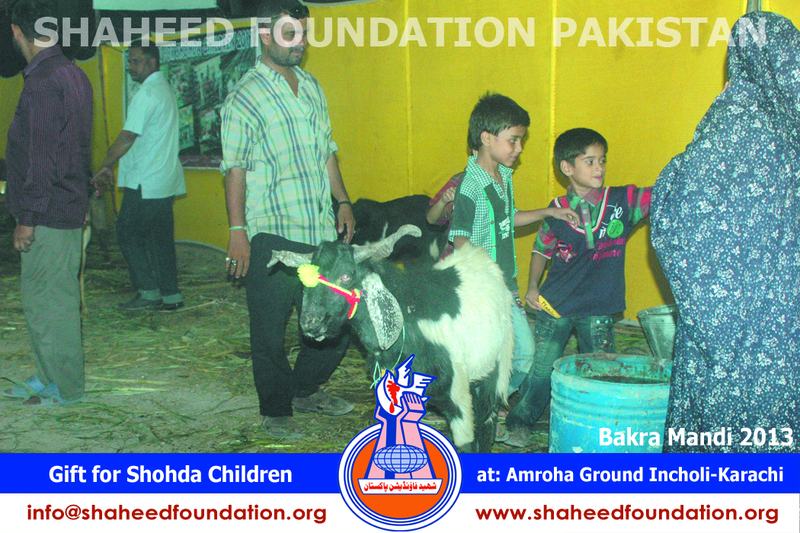 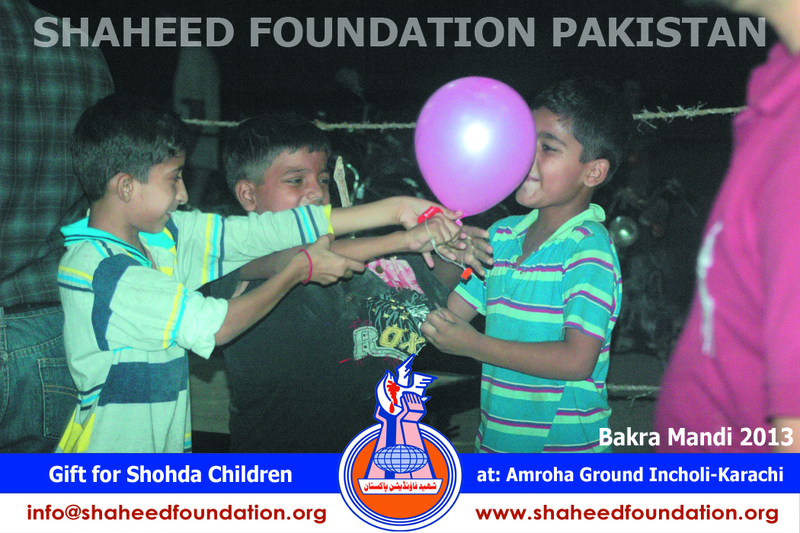 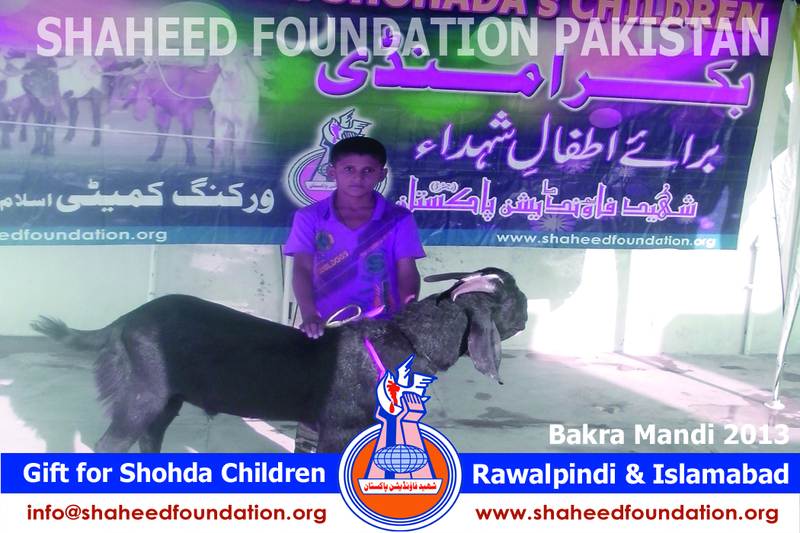 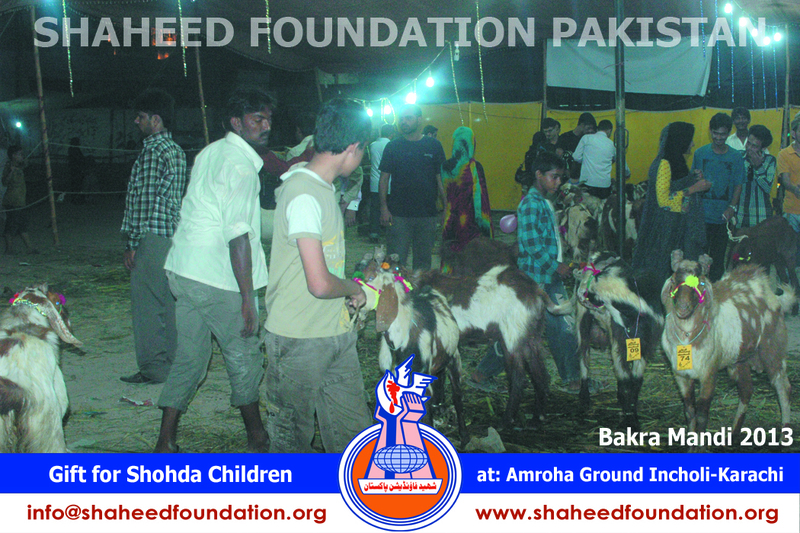 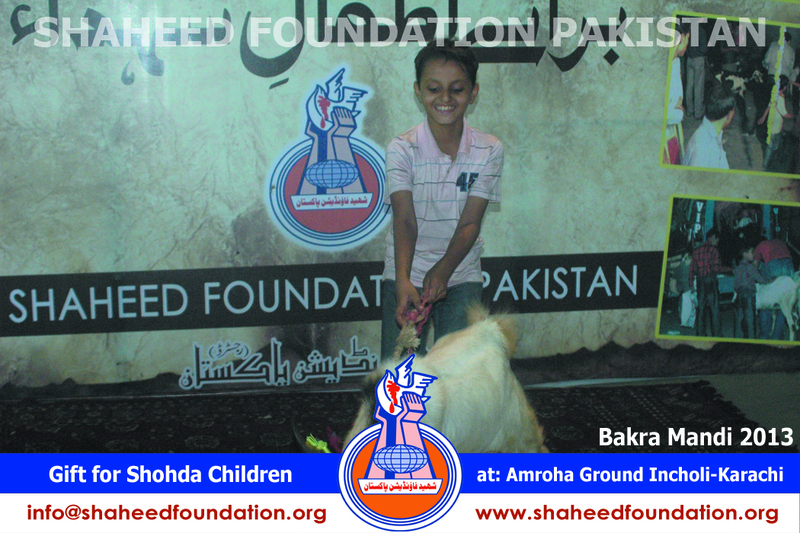 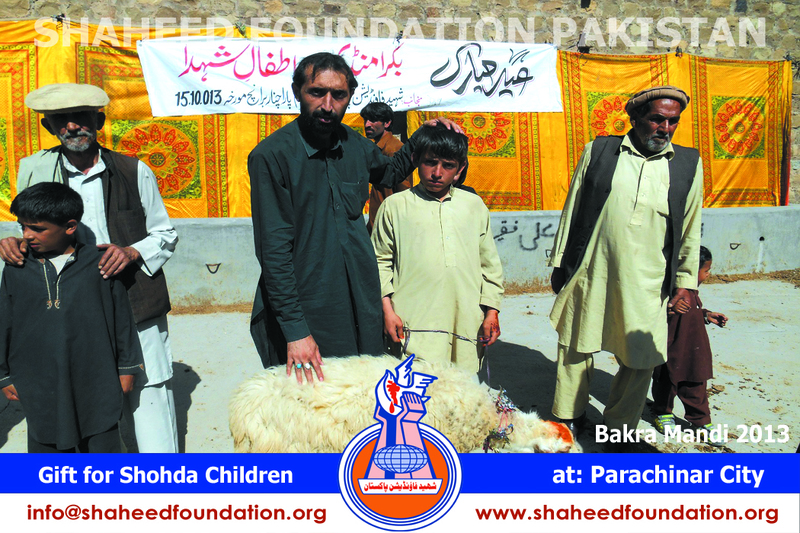 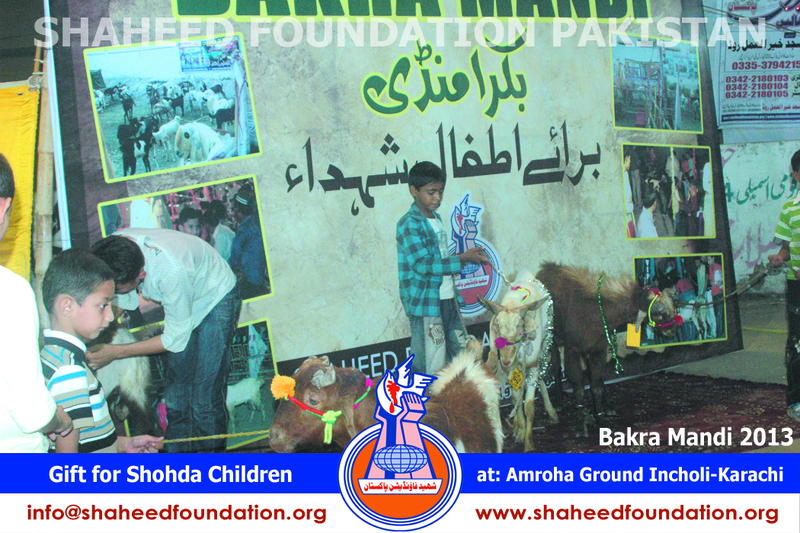 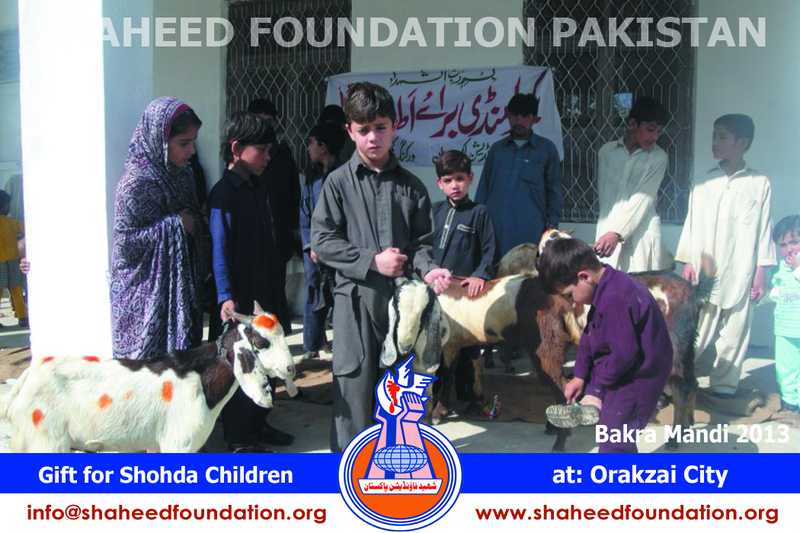 Shaheed Foundation Pakistan organized Bakra Mandi and martyrs children are invited in the camp. 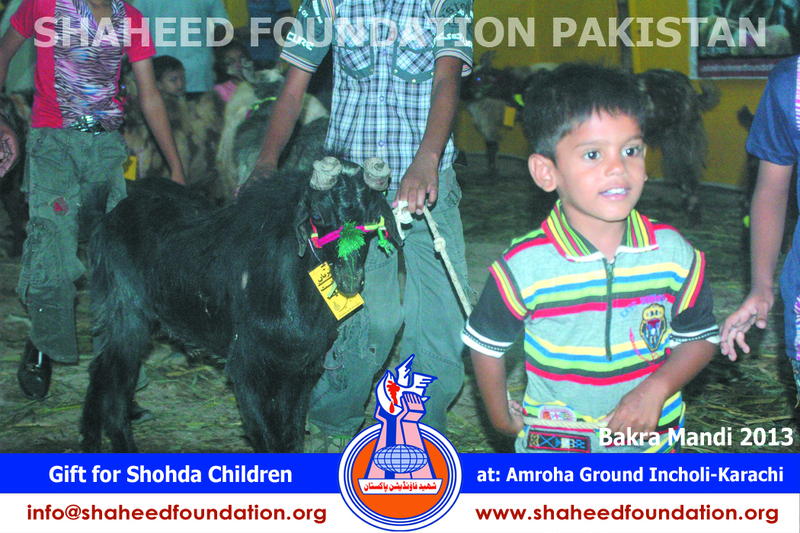 On camp day children come to the camps along with their working members, move around and choose the sacrificial animal of their own choice themselves. 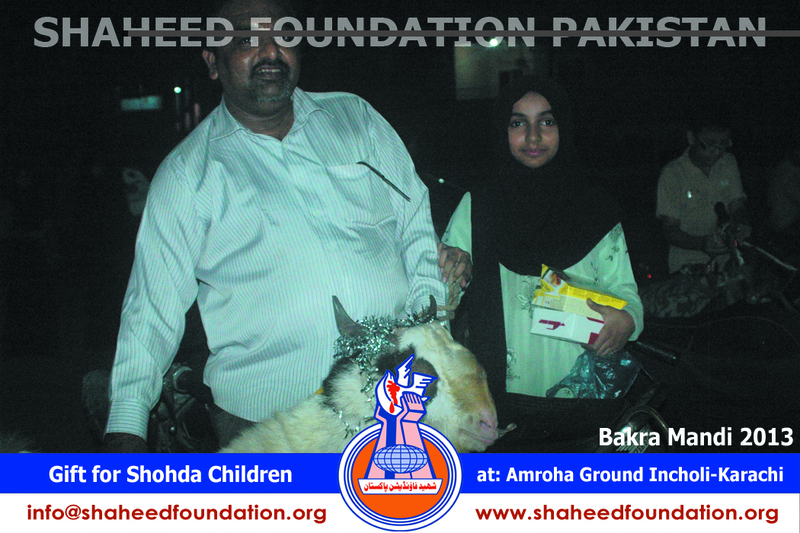 The animal is thus reserved for them as a gift and they take it back home happily. 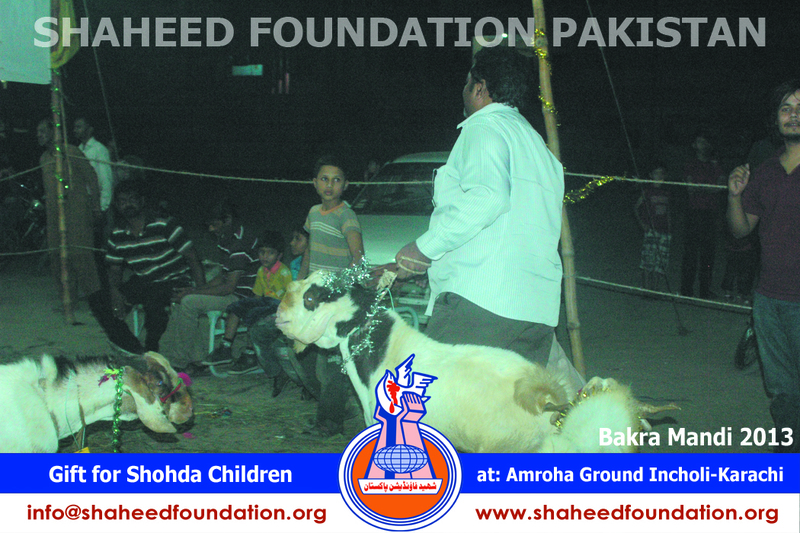 On one hand it gives them awareness of religious duty on Eid-e-Qurban .It also teaches them philosophy of sacrifice. 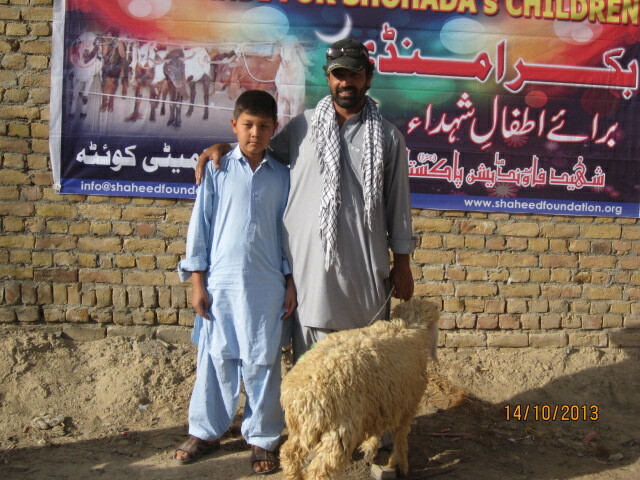 It averts any sense of deprivation that might be produced as a result of seeing other children of their age, who visit with parents and elders to get a sacrificial animal. 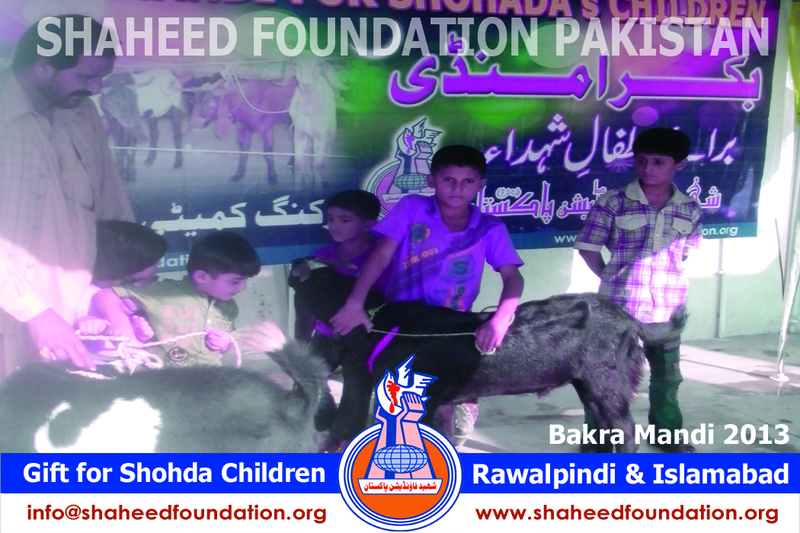 Besides its a healthy activity and the joy of the children can really be witnessed and felt ,as the young angels are all smiles on getting their `bakras`. 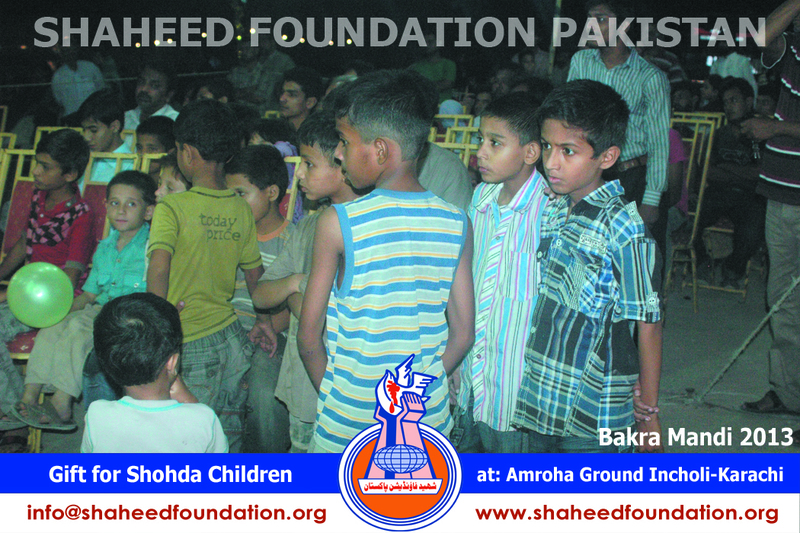 In accomplishing this project, our organization needs support from Momineens. 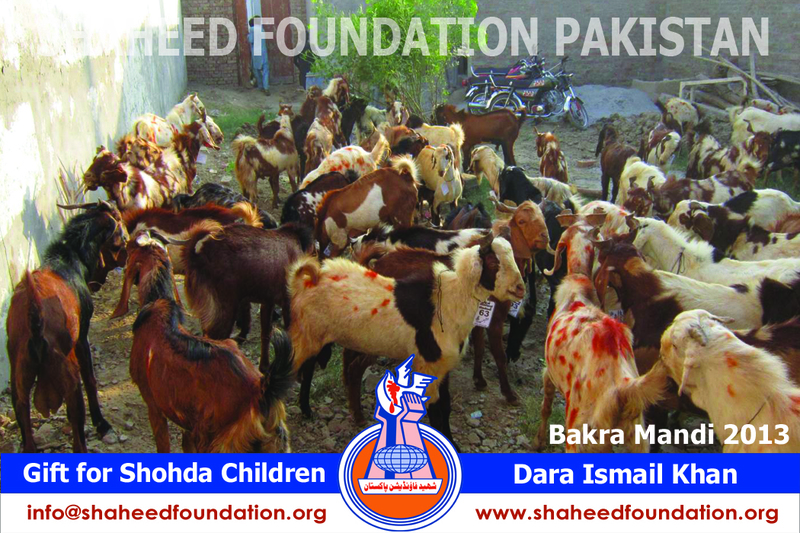 Under the present economic situation, animals are being sold at very high prices with different rates throughout Pakistan. 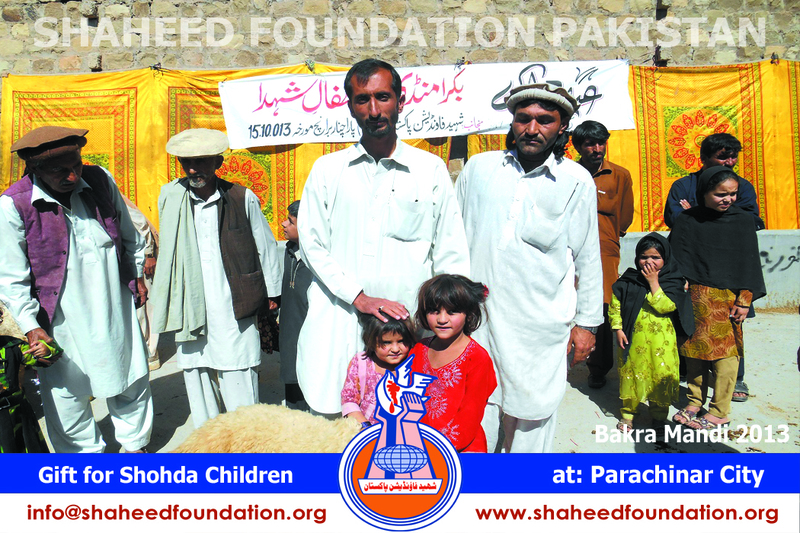 In these circumstances, SFP has fixed an average donation amount of Rs. 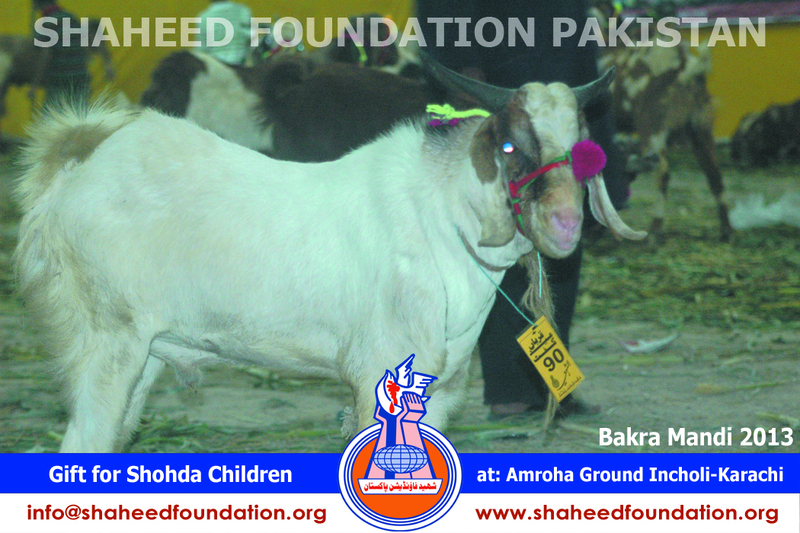 15000 per goat. 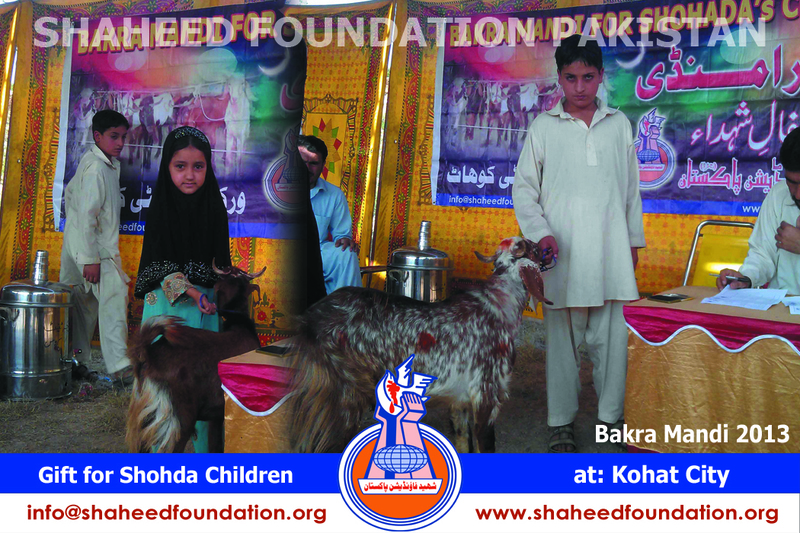 Approximately, 860 goats will be distributed kids of Shohada e Pakistan. 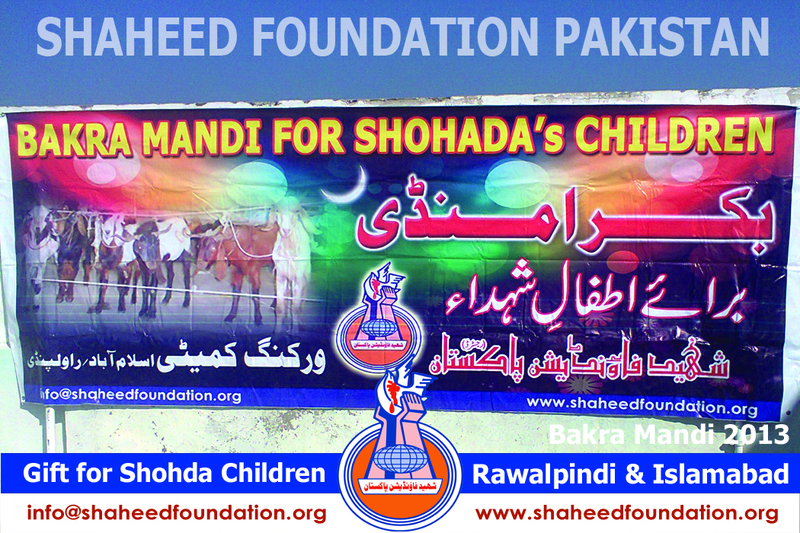 Momineen are requested to kindly come forward and generously contribute to this noble cause for bringing a smile and joys to our innocent angels!! 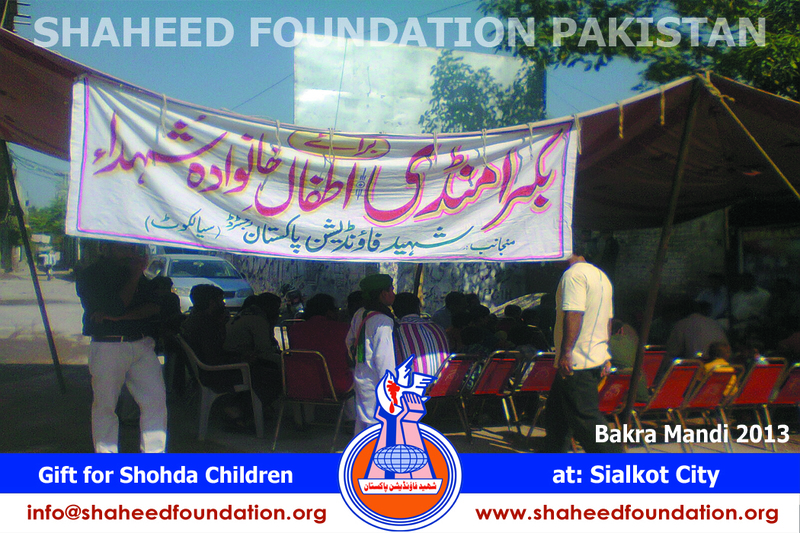 For your information, Shaheed Foundation Pakistan is currently supporting 1530 families of Shohada-e-Millat-e-Jaffaria in 53 cities across Pakistan with Rs.10,957,650/- monthly.